Thousands of protesters have been on the streets and squares of central Kiev for about three weeks, in rallies marred by violence. Kiev opted to sign a $15 billion deal with Moscow despite protester demands in the capital that Ukraine look westward. Go to Part 1 of live updates. 15:12 GMT: Ukraine’s parliament, the Verkhovna Rada, passes a bill awarding amnesty for all the pro-EU protesters detained on Kiev’s Maidan since the beginning of the unrest. 11:50 GMT: Next year, Ukraine will pay its citizens $750 million in compensation for their devalued deposits in the Soviet-era Sberbank, Yanukovich vows, adding that this sum is provided for in the 2014 budget. He adds that he personally insisted on the move, while members of the government of the former soviet state had their doubts about whether the expense was appropriate. In total, the Soviet-era Sberbank owes Ukrainians over $12.5 billion. 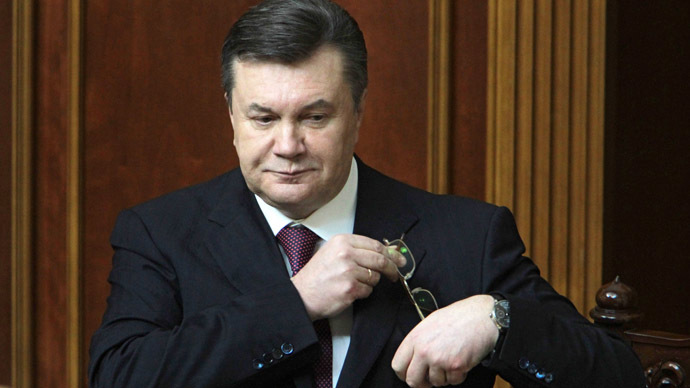 11:44 GMT: President Yanukovich says his decision to run for a second term in 2015 will depend on his rating. “If my rating is low and there is no prospect [to win the vote], I won’t get in the way of the country’s development,” he tells reporters. 11:25 GMT: Yanukovich slams opposition leaders for harboring their own political ambitions and conducting "revolutionary" actions. 11:18 GMT: President Viktor Yanukovich criticizes Western politicians who visited a protest encampment in Kiev during the unrest. He says he is opposed to the interference of representatives of other states in Ukraine’s internal questions and them feeling “they are masters here,” he tells journalists during a televised conference. “I’m categorically against anybody coming here and teaching us how to live,” he says. 11:15 GMT: Ukraine will accept a $15 billion aid package from Russia because of high gas prices and debt repayments to the IMF, Yanukovich says. That, however, does not contradict Ukraine’s policy of European integration, he adds. 22:19 GMT: EU foreign policy chief Catherine Ashton says that the new Russian-Ukrainian deal will not hinder EU’s resolve to sign an Association Agreement with Kiev. "The EU remains open to signing an Association Agreement with Ukraine. We do not believe that the agreement between Ukraine and Russia will create obstacles for this,” Ashton was quoted by Interfax. 14:07 GMT: Ukrainian pro-EU rally has the nationalist Svoboda party as its major driving force and the loudest voice. RT’s Aleksey Yaroshevsky has taken a closer look at the party’s slogans to find out they are quite contrary to European values. While western leaders used to harshly criticize Ukrainian right-wing factions some time ago, they now seem to see nothing wrong in walking side by side with those adhering to quite radical views. 12:25 GMT: Former Ukrainian foreign minister Vladimir Ogryzko says the recent economic aid deal signed between Kiev and Moscow will deprive Ukraine of its autonomy in managing its own foreign affairs and do nothing to keep the country from sinking further into debt. "Today the Ukrainian government has lost the right to foreign policy maneuvering," he said. Ogryzko added that after inking a deal for cheaper Russian gas, which will also see Russia purchase $15 billion dollars in securities from the debt-ridden country, Kiev will now be forced to coordinate matters of foreign policy with Moscow. He concluded that Ukraine had sold out its sovereignty to solve the country’s gas problem. “Instead finding a way out of the problems from living a life in debt, Ukraine has further been pulled into debt,” Pinzenik said. Pinzenik said the interest rate on the loan remained unknown, and at any time Russia could opt “to give or not give” the funds, making the credit a means of exerting pressure on Ukraine. 10:55 GMT: Ukraine’s Prime Minister Nikolay Azarov said that signing an agreement with the EU would have “given the country a New Year’s present” amounting to a crisis and a social collapse. To draw a parallel, the PM compared the prospect with a deal with Russia. “Let’s examine how the possible course of events, had we notreachedthat agreement [with Russia on December 17], if approximately a month ago we had not taken the tough but necessary decision of halting the signing of an agreement [with the EU]… after several days of applause and jubilation over the signing, Ukraine would have to face a tough reality,” Azarov said at a meeting on Wednesday. Russia is "surprised by attempts to put overt pressure on the Ukrainian government, which continue despite the decisions made in Moscow yesterday," Lavrov told the Federation Council, Russia’s upper house of parliament on Wednesday. Lavrov said Western attempts to influence Kiev were inherently contradictory, as they denied Ukraine the right to act in accordance with its own laws and national interests as a sovereign state. On Tuesday, Ukrainian President Viktor Yanukovich reached a deal with Russian President Vladimir Putin in Moscow that will see the Russian government buy $15 billion in Ukrainian debt by investing in Ukrainian securities using money from Russia's Welfare Fund. Also, from January 1, Ukraine will be able to purchase Russian gas for $268 instead of $400 per 1,000 cubic meters. 19:48 GMT: US Senator John McCain told The Daily Beast that Washington “did not threaten” Kiev with sanctions, but would consider sanctions in case the Ukrainian government attempts further violence against peaceful protesters. “We didn’t threaten the sanctions, but we both said that sanctions would be a consideration if there was any brutality against the protesters,” McCain said following his two day trip to Ukraine. While not specifying what these sanctions could mean, McCain said Kiev “should not have any doubt that there would be consequences for any further violence”. 19:30 GMT: Washington responded to the Kiev-Moscow deal by saying it “will not address the concerns of tens of thousands of Ukrainian protesters,” Reuters reported, citing White House spokesman Jay Carney. While saying White House officials had not seen details of the deal, in which Russia agreed to send a $15 billion lifeline to Ukraine, Carney claimed any such deal will not content the demonstrators protesting against Ukrainian President Viktor Yanukovich’s U-turn on the EU association agreement. 18:40 GMT: The Ukrainian opposition demanded the government lower tariffs on communal services by 30 percent after getting a “discount” on gas from Russia. Addressing President Yanukovich from a stage on Maidan, Arseny Yatsenyuk of the Batkivshchyna (Fatherland) party called on the government “to lower all the tariffs in Ukraine in connection with the lowering of gas prices” and was supported by cheers from a crowd of demonstrators, Interfax-Ukraine reports. 18:00 GMT: Ukrainian President Viktor Yanukovich has signed an agreement with Russian President Vladimir Putin, under which Russia is to buy $15 billion in Ukrainian debt by buying Ukrainian government securities. According to Putin, Russia will invest roughly 17 percent of its $88 billion National Welfare Fund for the plan. Yanukovich announced he also secured a more favorable Russian gas contract, with Ukraine now having to pay $268 per 1,000 cubic meters of gas instead of $400. 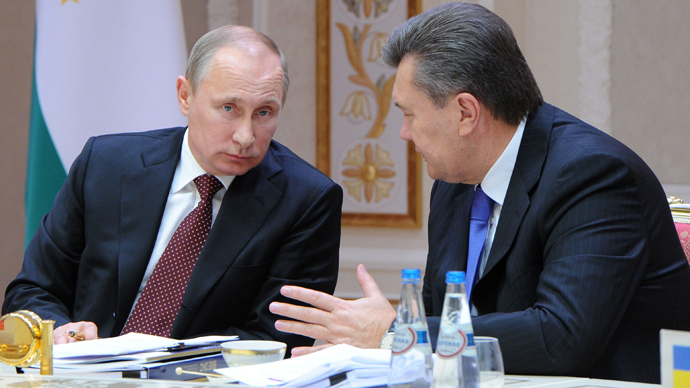 There was “not a word” about the Russia-led Customs Union during the Moscow talks, Yanukovich later stressed. 12:40 GMT: The Ukrainian parliament has attempted to start functioning again, but its session lasted less than 10 minutes on Tuesday. That was due to the fact that the opposition blocked the parliament’s tribune before the session began, and that’s happened for the second time this month. MPs are set to consider the country’s 2014 budget on Thursday. 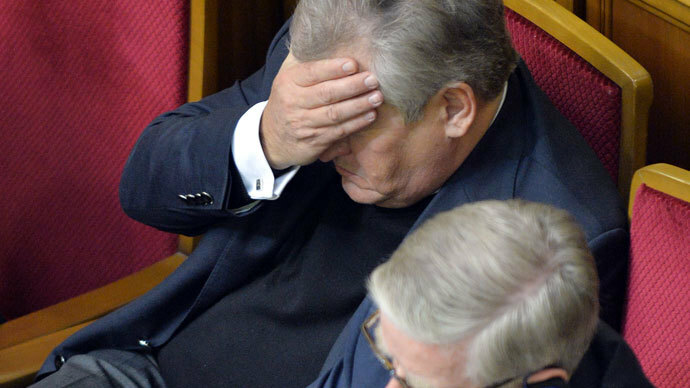 “The majority of the deputies are ready to work, not to block the parliament’s work,” Speaker Vladimir Rybak said, Itar-Tass news agency reported. 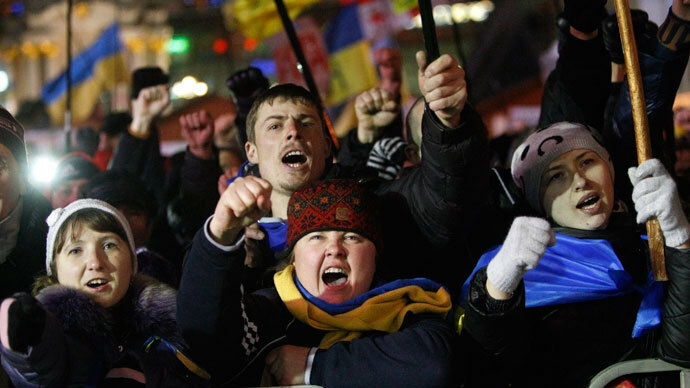 11:31 GMT: Protesters on Independence Square in Kiev are waiting for the results of President Yanukovich’s trip to Moscow. The Ukrainian leader arrived in the Russian capital on Tuesday and is currently meeting with President Putin to discuss economic cooperation and sign some documents. 13:11 GMT: Kiev should make up its mind about euro integration in order to re-start negotiations with the EU, according to Poland’s Foreign Minister Radoslav Sikorsky. He also said that the decision to stop the talks is sensible at the moment, as Ukraine should establish the format of its euro integration for the country. 11:00 GMT: The session of the Russia-Ukrainian interstate commission is set to take place on December 17 in Moscow, and will be presided by Presidents Putin and Yanukovich. Russia and Ukraine are set to sign a significant quantity of documents, according to Kremlin’s statement. 09:33 GMT: Russian Foreign Minister Sergey Lavrov is set to discuss the preparation for the January Russia-EU summit, as well as the situation in Ukraine, with the foreign ministers of the European Union (EU). Lavrov will also have a separate meeting with EU High Representative for Foreign Affairs and Security Policy, Catherine Ashton. Vytautas Leskevicius, Deputy Foreign Minister of Lithuania, which is currently the chairman of the EU Council, emphasized that Russia’s foreign minister would be told about the "inadmissibility of putting pressure to bear on Ukraine." Earlier, Vladimir Chizhov, Russia’s Permanent Representative at the EU, had spoken about the accusations of Russia “pressuring” Ukraine in an ITAR-TASS news agency interview. In his turn, he said that it’s the EU which is putting pressure on Ukraine and compared the EU actions akin "to steamrolling." 03:50 GMT: Ukraine is planning to agree to Russian gas prices and resume talks about a three-party gas consortium to look after Ukraine’s pipeline network next week, Prime Minister Nikolay Azarov told Ukraine’s Inter TV channel. An intergovernmental Russian-Ukrainian commission is scheduled to take place in Moscow on Tuesday. Yanukovich is said to be in attendance. 00:04 GMT: Ukraine’s Prime Minister, Nikolay Azarov, stated that no documents will be signed in relation to the country joining the Customs Union during the interstate commission meeting on December 17 in Moscow. He clarified that before anything is signed, it must be approved by the cabinet and “right now there are no documents that directly or indirectly have any relation to the Customs Union,” Azarov told Inter TV channel. 23:06 GMT: US Senators John McCain and Chris Murphy met with Ukrainian President Viktor Yanukovich. The president “emphasized the invariability of the European integration course of Ukraine and the faithfulness to national interests of the state,” according to the leader’s website. Yanukovich assured that the government will do everything in its power to make certain that citizens’ rights for peaceful demonstrations are protected, and confirmed that there will be an investigation into the events of November 30 on Independence Square - the day security forces launched a crackdown on protesters. The two sides have agreed to continue negotiations. 19:55 GMT: Ukrainian Prime Minister Nikolay Azarov is hoping for a breakthrough in re-negotiations of the price of Russian gas during an economic forum with his Russian counterparts on Tuesday. Cash-strapped Ukraine has been locked into a high-priced contract with Russia, which sees it pay substantially more than the European average. Azarov said he hoped to bring supply prices in line with the rest of the continent. 17:10 GMT: Opposition activists have ended their protest outside Ukraine’s Security, Internal Affairs and Central Election Committee offices. The crowd has moved to Independence Square, where opposition supporters have been camping out during three weeks of protests. No violence has been reported. 15:13 GMT: Opposition MPs in the Ukrainian Parliament have collected more than 170 signatures for the dismissal of the government of Prime Minister Nikolay Azarov, parliamentarian Oles Doniy told reporters. “When I put my signature, it was the 175th,” Doniy said. Taking into account the votes of the Communist party, the resolution already has the support of around 210 deputies - much more than the 150 votes required for the bill to be considered. On December 3, parliament participated in a no-confidence vote for the current government, but the motion was defeated and the government stayed in place – much to the disappointment of opposition leaders. The opposition is urging parliament to once again consider the dismissal of the government on December 17, the 66th birthday of Prime Minister Azarov. 15:17 GMT: Three columns of demonstrations have moved out from Independence Square to hold protests in front of the Ukrainian government buildings in Kiev. 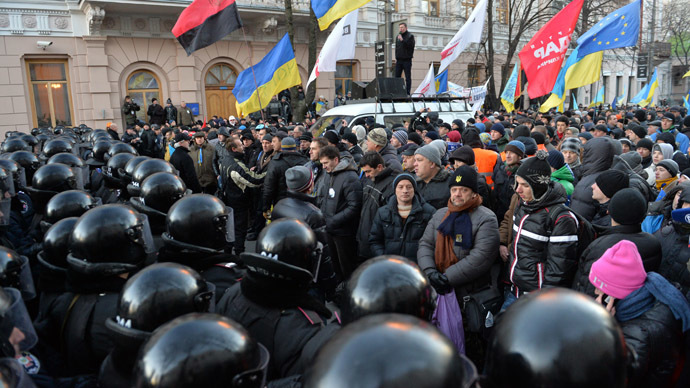 The opposition leaders sent their men to the Ukrainian Security Service headquarters and the Interior Ministry, claiming that those agencies were responsible for the violent crackdown on the Maidan rally on November 30. The third group is heading towards the Central Election Committee due to early parliament elections taking place in five of the country’s districts on Sunday. 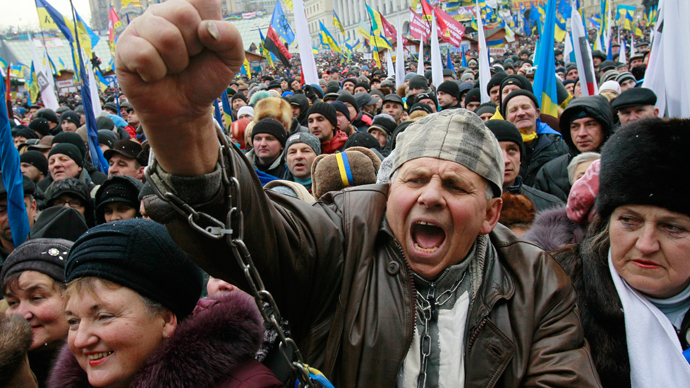 12:50 GMT: US Senators John McCain (R-Ariz.) and Chris Murphy (D-Conn.) have addressed the anti-government rally in Kiev. As McCain took to the stage, he told demonstrators that their peaceful protests are "inspiring the world." "People of Ukraine, this is your moment. This is about you, no one else. This is about the future you want for your country. This is about the future you deserve," he said. "We are here to support your just cause, the sovereign right of Ukraine to determine its own destiny freely and independently. And the destiny you seek lies in Europe." “The US is with you,” he vowed to the crowd. McCain was accompanied on stage by Sen. Christopher Murphy. “Ukraine's future stands with Europe, and the United States stands with Ukraine," Murphy said, urging protesters to continue their fight. 12:39 GMT: US Senator John McCain has met with opposition leaders. He said that Ukraine’s future is with Europe and voiced his support for pro-EU protesters. 12:21 GMT: Over 35,000 pro and anti-EU supporters have gathered for mass protests in Kiev, says Kiev police press service. 20,000 people are now on Independence Square, while 15,000 activists have gathered in Mariinsky Park. 12:10 GMT: One protester died during the pro-EU demonstration on Independence square. A police official said the body didn’t bear any signs of violence. The possible cause of death might have been a heart attack, the official added. 11:35 GMT: Ukraine should maintain friendly relations with Russia, says Vitaly Klitschko, the leader of the Udar (Strike) Party, Der Spiegel reports, as cited by Itar-Tass. “Every country needs normal relations with its neighbors. And Russia is one of our most important trade partners. However, Ukraine shouldn’t forget about its own interests,” he said. When asked about the possible division of Ukraine into conservative east and pro-European west, he said that “the reasons for both pro and anti-integration protests are the same - unemployment, poor medical service and injustice”. Klitschko has also reiterated his intention to run in the 2015 presidential elections. 11:15 GMT: 18,000 people have gathered on Independence Square to support EU integration, while 15,000 activists came to support the ruling Party of Regions in Mariinsky Park, as of 1pm local time, according to police estimations. 10:48 GMT: Several thousand activists supporting the ruling Party of Regions have gathered in Mariinsky Park for a rally to support Ukrainian President Viktor Yanukovich, Interfax-Ukraine reports. There are several buses with police nearby. It was earlier announced that the demonstration will take place on European Square, but then the location was changed to Mariinsky Park which is near the Cabinet of Ministers and Ukrainian parliament buildings. 10:10 GMT: About 2,000 people have gathered in the center of Simferopol, the capital of Ukraine's Autonomous Republic of Crimea, to show support for the Ukrainian authorities, reports RIA Novosti. They are scheduled to take a train to Kiev to show their disagreement with the opposition and urge the government to stop the destabilization of the country. “Those who are currently protesting on Maidan [Independence Square] are lying. This is not the opinion of the whole nation. The people of South-Eastern Ukraine have their own opinions and are indignant about the latest events in the country,” said Crimean Vice Premier Rustam Temirgaliev. 09:50 GMT: Opposition activists are arriving on Independence Square for a public gathering which is scheduled 12:00 local time (10:00 GMT), says RIA Novosti. Some of the protesters stayed on the square overnight. The demonstration of the ruling Party of Regions to support the Ukrainian president, Viktor Yanukovich, will take place on European Square at the same time only hundreds of meters away from Independence Square. Protesters are also starting to gather on European Square, though at the moment there are few people there except for police cordons. So far police officials haven’t reported any violations or mass disorder in the places where the protests are scheduled. 06:50 GMT: Parliamentary by-elections are being held on Sunday in five constituencies of Ukraine, amid the ongoing mass protests in Kiev. The polling was called by parliament after the Central Electoral Commission dismissed the results of the 2012 general election, citing violations. The Commission called upon all participants of the mass protests not to campaign for their candidates on the election day, since it would violate the law. An astounding 70 candidates are running for the parliamentary seat in one of the constituencies. The large number resulted in ballot papers there being one meter long. The commission is to announce the results of the by-election no later than December 30. 06:15 GMT: The leader of the opposition nationalist party, Bratstvo (Brotherhood), Dmitry Korchinsky, has been put on the international wanted list, says Vasily Paskal, the head of the criminal investigation department of the Ukrainian Interior Ministry. “We have information that certain members of Korchinsky’s organization – about 15 people – have been living in his office. He used them to carry out the most radical actions,” Paskal reported to the country’s interior minister. According to the Ukrainian Interior Ministry, more than 300 Bratstvo activists, guided by Korchinsky, were behind the clashes outside the Presidential Administration building on December 1. They used a bulldozer to push back on a cordon of police officers and security troops. Over two hundred people, including protesters and police officers, were injured in the scuffles on that day. On December 5, Ukrainian prosecutors made a request to the Kiev court to arrest Dmitry Korchinsky. 20:00 GMT:“Provocations” and “civil disorder” on November 30 were planned in advance, chief internal ministry investigator Nikolay Chinchin has said at a Kiev press conference. “As far back as November 24 we started to investigate crimes by radicals who has infiltrated peaceful protests. According to the documents we confiscated, it is easy to see who was supposed to go where, and who was responsible for what, as well as who funded the disorder,” said the official. Chinchin said that most of the “instigators” were between 15 and 20 years of age, and have already been identified and questioned. 19:20 GMT: Ukraine’s foreign minister Leonid Kozhara has assured visiting US senator John McCain that integration with Europe remains a “priority” for the current government, according to an official ministry statement. The politicians reportedly mostly discussed the government’s handling of the current wave of protests; McCain also met with opposition leaders today. 19:15 GMT: Deputy mayor Anatoly Golubchenko will assume the duties of mayor at least until Monday, after Yanukovich suspended Aleksandr Popov for using violence against protesters a fortnight ago. Golubchenko said that a further discussion of who will take charge of the city will take place next week. 19:05 GMT: Lithuanian foreign minister Linas Linkevicius has met with opposition leaders Vitaly Klitschko and Oleg Tyagnibok, to express his support for the pro-European protests. After the consultations, Linkevicus came down to Independence Square, where he handed out sets of traditional Lithuanian gloves to overnight demonstrators as a gesture of solidarity. 18:54 GMT: The Ukrainian ruling Party of Regions has estimated that some 200,000 of its supporters have come to Kiev's European Square to back President Viktor Yanukovich and his cabinet’s anti-EU move. Despite the Party of Regions’ estimate, local police have put the number of activists at around 60,000 people. 12:28 GMT: Ukrainian President Viktor Yanukovich has suspended the Mayor of Kiev, Aleksandr Popov, and deputy secretary of the National Security and Defense Council, Vladimir Sivkovich, from office. 12:01 GMT: Kiev’s mayor and the country’s top security official were involved in the brutal eviction of a protest camp by Berkut [special police unit] on November 30, Ukraine’s general prosecution said. The prosecution is now seeking house arrest for the two. The prosecutor general is advocating their removal from office. “The investigation is preparing a request to the court asking for the two officials to be put under house arrest,” Prosecutor General Viktor Pshonka said. 11:45GMT: The Ukrainian government will sign a package of agreements with Russia next week which will provide new jobs, said Ukrainian PM Nikolay Azarov, addressing the protesters on European Square. “Our market is in Russia,” said the PM. According to Azarov, the agreement will be profitable to a number of Ukrainian industries, particularly in the spheres of aircraft and mechanical engineering. Azarov also stressed Ukraine is not joining the Customs Union of Belarus, Kazakhstan and Russia, adding that Ukraine is continuing to move towards EU integration. 11:22GMT: The leader of the opposition nationalist party Bratstvo (Brotherhood), Dmitry Korchinsky, who is suspected of organizing the mass public disorder on December 1, has left Ukraine, says the Ukrainian Ministry of Internal affairs. The authorities haven’t specified the exact whereabouts of the opposition leader, saying only that the investigation is ongoing. On December 1, scuffles between the security cordon and the opposition took place near the presidential administration in Kiev, after which over 140 police officers were injured with 75 of them taken to hospital. Nearly 165 activists sought medical help after these disturbances. 11:12GMT:“Ukraine should be a proper partner of the EU, not just its ‘appendix’,” said Ukrainian PM Nikolay Azarov, addressing the protesters supporting the ruling Party of the Regions on European Square. Azarov explained the position of the government towards the association agreement. He stressed that Ukraine couldn’t have signed an agreement ‘which would lead the country to bankruptcy’. 09:52GMT: A police cordon is set up near European Square, blocking nearby roads and passageways. The cordon’s main aim is to prevent confrontations between the protesters. European Square, where the ruling Party of Regions is launching a rally, is situated next to Independence Square, the main location for the pro-European opposition. 09:09GMT: Russian FM Sergey Lavrov has criticized the policy of the EU towards Ukraine in an interview with the Rossiya 24 TV channel. “Russia has no doubt that provocateurs stand behind the mass protests in Ukraine,” said Lavrov. Lavrov defended the Ukrainian government’s right to take decisions on its national policy and also chided Western officials who are demanding immediate signing of the association agreement. 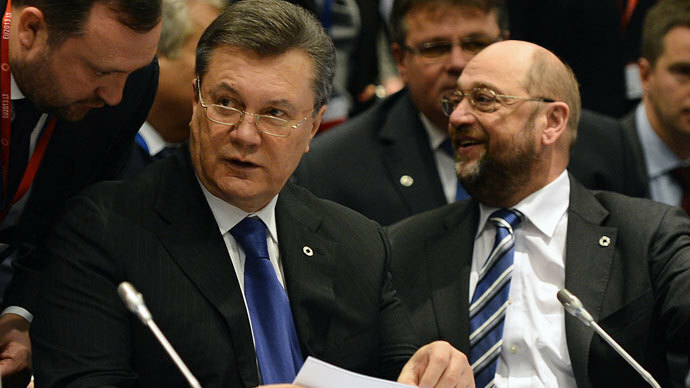 He stressed that the EU’s motives have nothing to do with the interests of the Ukrainians. The Ukrainian people and its government should settle the conflict on their own, the FM said. 08:52GMT: The demonstration of the supporters of the ruling Party of the Regions will last as long as it takes, said the party’s official, Mikhail Chechetov: “Our demonstration will continue till the situation in the country is stabilized,” he said. He also condemned the opposition’s actions saying it wants to “discredit the government and the president at any cost”. “We only support EU-integration if it considers our own national interests,” he explained. 08:31GMT: Ukraine’s national counter-terrorism center is on alert after receiving a number anonymous tips of upcoming bombing attacks during large public gatherings in Kiev, the center announced. All the measures taken by the Ukrainian Security Service, the Ministry of Internal Affairs and other authorities “are aimed to provide security for Ukrainian citizens and prevent any terrorist attacks,” the statement said. The measures are preventive in nature and include “the exchange of information between executive bodies and checks-up of all personnel and equipment,” which would be needed in case of emergency, it added. 07:26GMT: Ukrainian Prosecutor General Viktor Pshonka reported on the ongoing investigations into the mass protests in Kiev to a delegation from the European Committee for Prevention of Torture (CPT), his office said. He said that over 400 people had sought police help after they were injured during mass protests in Kiev since they started on November 24. Nearly 200 of them were policemen and just 18 were students, he stressed. Pshonka gave an assurance that his office is paying close attention to all the investigations, both against alleged rioters among the protest activists and police officers suspected of brutality. “Today we have received the results of the Ministry investigation over the events of November 30, which we are going to analyze,” he told CRP president, Latif Huseynov. “We are trying to find the provocateurs both from the opposition and the police force,” he added in a reference to the brutal eviction of a protest camp by Berkut [special police unit], which was widely criticized both in Ukraine and other nations. 06:22GMT: The ruling Party of Regions is launching a rally to support the Ukrainian president, Viktor Yanukovich, Itar-Tass reports. It will last the whole weekend, party officials say. 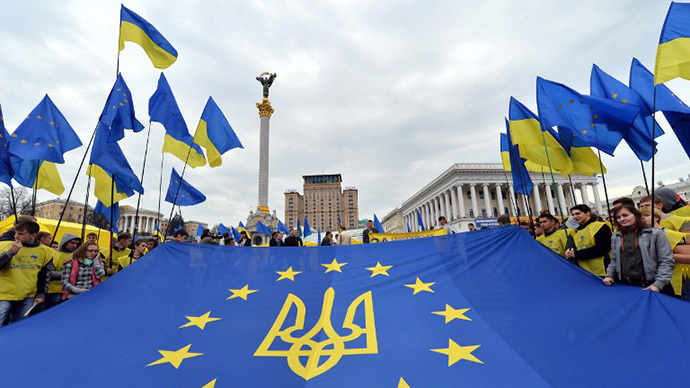 The demonstration will take place on European Square next to the Ukrainian parliament. Several thousand protesters, carrying Ukrainian flags and banners, had already gathered in Mariinsky Park near the parliament building in the morning. Most people at the rally come from eastern and southern parts of Ukraine, where support for the government is strong. “We came here to support our president. Ukraine needs a stable economy,” said one of the protesters. The motto of the rally is “Save Ukraine – our common motherland.” At the same time, opposition activists are arriving for a public gathering on Independence Square. “The talks between the opposition and the president failed yesterday. So we have to come out onto the streets if we want to be heard,” says opposition leader, Vitaly Klitschko. 00:52GMT: Mass protests hinder the interests of the state, Ukrainian Foreign Minister Leonid Kozhara told Inter TV channel on Friday evening. According to Kozhara, the mass protests harm Ukraine’s position during talks with the European Union, with EU officials saying “we should sign right away” since the protesters are demanding nothing more than for Ukraine to partner up with the EU. On the other hand, when Ukraine negotiates trade and gas prices with Russia, officials there tell the country’s representatives to first “sort out” everything at home and figure out what Ukraine wants. 23:48 GMT: US Democratic and Republican senators introduced a resolution that asks the US to consider the use of sanctions against Ukraine if violence against protesters continues to take place. The resolution urges a “peaceful and democratic conclusion” to the demonstrations. "It is absolutely imperative that this weekend's protests be allowed to proceed peacefully," State Department deputy spokeswoman Marie Harf told reporters on Friday. 21:50 GMT: Senator John McCain is scheduled to visit Ukraine on Saturday and Sunday, The Daily Beast reported. The trip comes after US Assistant Secretary of State Victoria Nuland visited Kiev this week, even going to Independence Square to see the protests firsthand. “Senator McCain is traveling to Ukraine to meet with government officials, opposition leaders and civil society at this critical time as Ukrainians struggle for their future,” McCain spokesman Brian Rogers said. The Democratic chairman of the Senate's Europe subcommittee, Chris Murphy, will be joining McCain in Kiev on Sunday. 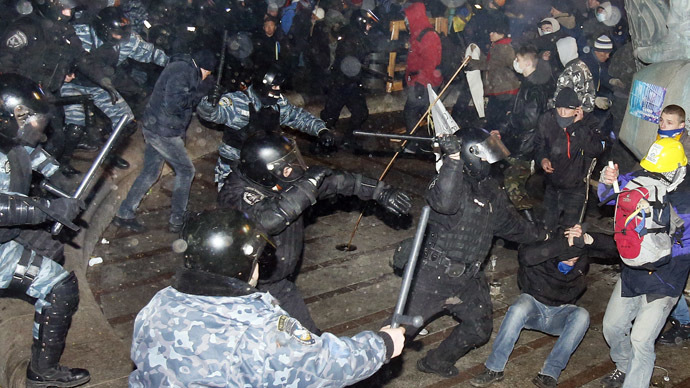 20:28 GMT: Kiev authorities said they identified policemen who violated the law during protests in the city center. According to preliminary reports, some of the officers did use unnecessary force against protesters. 14:00 GMT: President Viktor Yanukovich has proposed imposing a moratorium “on any forcible actions” by both law enforcement troops and opposition activists. He has also suggested amnestying the people who were recently arrested for involvement in riots in Kiev. "As for a punishment for those guilty, where we are sure let's punish them. Where people suffered, let's make a decision and vote for amnesty on Tuesday and we will settle all issues," Yanukovich at a nationwide roundtable meeting at Ukraine Palace in the capital. 13:57 GMT: Ukrainian President Viktor Yanukovich has said that he and his government will not resign, and only the parliament has the right to fire him, the presidential press service reported. "Procedure for the resignation of the Cabinet of Ministers requires a vote in the parliament, and then the corresponding actions of the president. Voting has already taken place, and you saw it," Yanukovich said, referring to a vote of the Ukrainian Cabinet of Ministers, headed by Prime Minister Nikolay Azarov, on December 3, which survived a “no confidence” vote. The motion of no confidence was called in the Rada on December 2 by the Homeland (Batkivshchina), Strike (Udar), and Freedom (Svoboda) opposition parties. Only 186 MPs voted for the motion, well short of the majority of 226 needed for it to pass. 13:45 GMT: The Russian Foreign Ministry is ‘appalled’ by the remarks of US representatives towards the situation in Ukraine, Sergey Ryabkov, Deputy Foreign Minister told the Russian newspaper Rossiyskaya Gazeta. “They are not recommendations but ‘peremptory demands’ towards the Ukrainian government. They are formulated trenchantly and reflect a certain interplay of emotions and a special course of actions,” he adds. 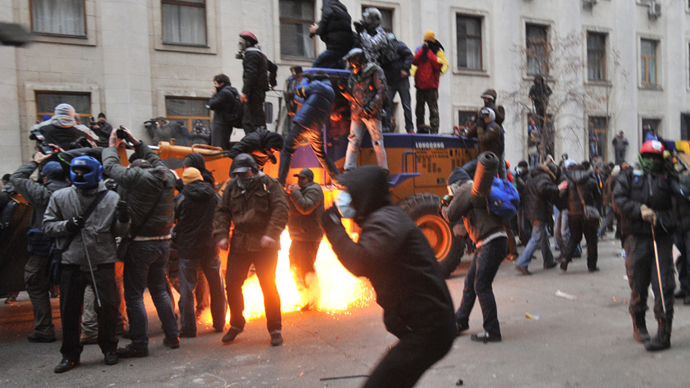 13:15 GMT: Ukrainian President Viktor Yanukovich proposes amnesty for those detained during recent mass protests in Kiev. “I believe we should turn the page over. I propose at the round-table (talks with the opposition) to release people detained during the protests, even those who were charged,” said Yanukovich in a statement. The amnesty should only apply to activists who were detained accidentally, while those guilty are to be punished, added Yanukovich. The Kiev court has already released eight of nine activists detained after their attempt to retake the presidential administration in Kiev on December 1. Some of the activists were fined or released on bail, some got probation, while one was under house arrest. However, one activist still remains in custody pending trial. Vitaly Klitschko of the Udar (Strike) Party, Arseny Yatsenyuk of the Batkivschina (Fatherland) Party and Oleg Tyagnibok of the Svoboda (Freedom) Party said they will try to find a compromise to the crisis which brought hundreds of thousands of people out in protest on the streets of Kiev. "We will pass your demands on to [Yanukovich]. 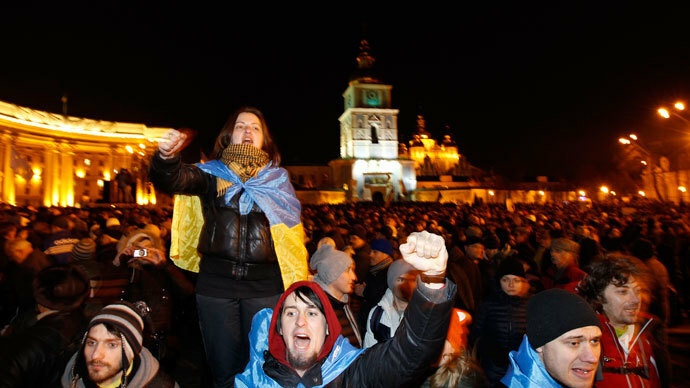 We will fight for our general victory," said Yatsenyuk, addressing the crowds on Independence Square. 12:03 GMT: Both opposition and pro-government protesters are planning to hold demonstrations on Sunday, reports Interfax-Ukraine. The Party of the Regions is planning to organize their demonstration on European Square next to Verhovna Rada, the Ukrainian Parliament. The meeting of the pro-government supporters is scheduled for 10.00 GMT (14.00 local time) according to the Ukrainian newspaper “Vesti”. All in all, over 200 thousand pro-government protesters will attend the meeting. “We are not going to have any confrontations with the opposition. We just want to be heard,” says the leader of the Party of the Regions, Alexander Efremov. At the same time, the opposition parties, Svoboda (Freedom), Udar (Strike) and Bat’kivshchina are also preparing for a public gathering on Independence Square. Hundreds of thousand people are scheduled to take part in the rally. 10:45 GMT: The protest camps in central Kiev are being secured by 4,000 members of the pro-nationalist ‘defense forces’, as they call themselves. Anyone can join their ranks, according to a statement from one of the event’s organizers, Ukraine’s Interfax reports. They will be taught specialist skills, like first-aid and manning barricades. The organizers of the opposition camps are hoping that such little armies will become a mainstay of the opposition, as it tries to insert some order into its ranks. 10:33 GMT: Thousands of Crimean citizens plan to travel to Kiev to protest the actions of the opposition, according to the area’s deputy prime minister. 10:26 GMT: RT’s Aleksey Yaroshevsky is reporting live from Kiev, where Euro-themed doughnuts can now be seen. 09:10 GMT: There were no reports of any violations or mass disorder happening overnight in Kiev, local police officials reported. The majority of protesters remain on Independence Square according to the Ukrainian Interior Ministry. Over 1,900 officers were keeping the order overnight in Kiev, a ministry statement said, reiterating a call to protesters to behave reasonably and not fall for provocations. 02:33 GMT: Kiev authorities say the damage caused by protests in Kiev is estimated to be around several hundred million hryvnia (UAH), ITAR-TASS reported. At the current exchange rate, 1 UAH trades at 0.12 USD. 18:26 GMT: Ukraine and the EU have agreed to prepare a road map for the implementation of the trade and association agreement, said EU commissioner Stefan Fuele. The negotiations will take place without the participation of Russia, he added as quoted by RIA Novosti. 18:20 GMT: Ukraine’s deputy prime minister says that Ukraine will “soon sign” a free trade and association agreement with the EU, Reuters reports. 17:45 GMT: Ukraine needs a 20 billion euro loan from the EU “on normal conditions”, Ukraine’s premier Nikolay Azarov said, as quoted by ITAR-TASS. Also, Ukraine wants to change the conditions for the implementation of the agreement on trade union with the EU, not the text of the agreement, the country’s Prime Minister Nikolay Azarov said, as quoted by RIA-Novosti. He added that unfavorable terms of implementation in other countries led to the liquidation of whole branches of production. 17:05 GMT: Seven of nine participants in the December 1 riots in central Kiev, and two of the three people prosecuted for protests near the mayor’s administrative building have been released in Kiev. "We won't stop at that, we'll demand their full rehabilitation and the closing of the cases," an MP from the “Batkivschyna” party, Pavlo Petrenko, said at a news briefing. 16:38 GMT: Ukraine and the EU have renewed talks in preparation for signing the agreement on trade association, Ukraine’s Foreign Ministry said. 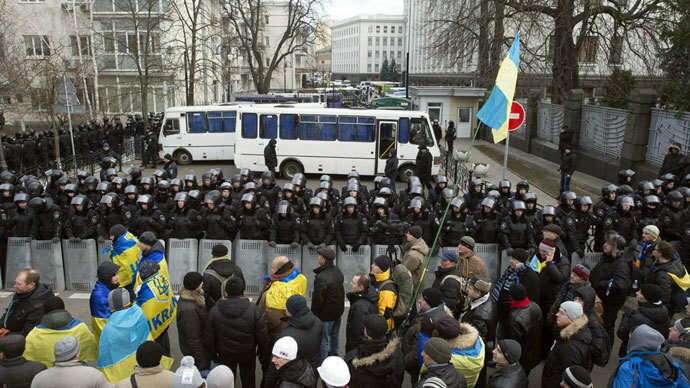 Major unrest swept the country’s capital following the announcement over two weeks ago that the Ukrainian leadership wasn’t going to sign the agreement. 16:23 GMT: Around 5,000 people are currently demonstrating on Independence Square. There are no security forces there, ITAR-TASS reports. The city center is filled with barricades made of snow bags, which protesters poured water on to create a kind of ice wall. The highest barricade measures 3 meters. The protesters have also been burning fires across the city center and have blocked access to the square with advertisement banners and construction materials, which remainedthere after the community services’ employees prepared the square for the New Year celebrations. 16:00 GMT: The Ukrainian army hasn’t been called to participate in the political rallies in the country, and won’t be, Ukraine’s Defense Minister Pavel Lebedev said. According to the country’s constitution, the army has no right to participate in such events, the Minister pointed out. 15:34 GMT: Ukrainian Foreign Minister Leonid Kozhara has said that the principal way to deal with the situation in the country should be through negotiations between all sides of the conflict. "I think that this is an extreme measure, which would show the inability of the government and the opposition to hold constructive talks. And if this happens, then we can certainly use the services of some very influential intermediaries," the Foreign Minister told Interfax-Ukraine. 15:07 GMT: Russia is putting pressure on Ukraine, and the EU should think of measures in response, according to a resolution issued by the European Parliament on Thursday as a reaction to the situation in Ukraine. The European Parliament reiterates "its firm condemnation of the unacceptable political and economic pressure, coupled with threats of trade sanctions, being exerted by Russia on Ukraine." In this regard, the European Parliament is urging the EU and its member states to speak to Russia "with one voice, and calls for the EU, together with its member states, to develop and implement a policy of appropriate responses to these tools and measures used by Russia against its eastern partners." 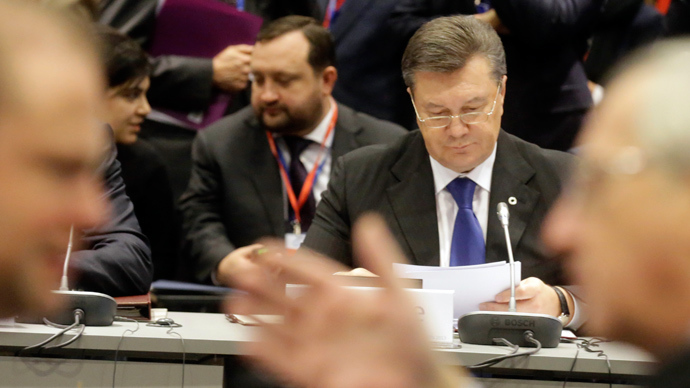 Earlier, Ukraine refused to sign the agreement on a trade union with the EU. Russia has warned the country that a free trade zone with the EU and the participation in the Customs Union for CIS countries are incompatible. 14:37 GMT: Representatives from Ukraine’s activist community, as well as the EU, should take part in the dialogue with the country’s current government, one of the opposition leaders, Vitaly Klichko, said at a news conference. It comes after President Yanukovich proposed a round table to discuss the situation with the participation of the community, opposition, and clergy. 14:03 GMT: Protesters taking the statue of Lenin apart on Kiev’s Independence Square, after toppling it a few days earlier. In the wake of the collapse, announcements selling parts of the statue emerged on the internet. 13:26 GMT: The “Clean Thursday” campaign has been launched by the protesters on Kiev’s Independence Square. The campaign is not political and involves cleaning up the camp and around it. There is now a lot of rubbish and snow in the camp, and the protesters are cleaning up the territory, ITAR-TASS reports. 12:58 GMT: About ten buses with policemen from the eastern Ukrainian city of Donetsk left for Kiev on Thursday. “This is about replacing the personnel in Kiev. Our staff have been sent to the capital. These are not special forces, they are just ordinary employees of the patrol and inspection service,” the head of the PR department for Ukraine’s Interior Ministry in Donetsk told RIA-Novosti news agency. Protests have been going on in the capital for over two weeks now. 12:06 GMT: The European Parliament has urged an immediate launch of a new EU mediation mission "at the highest political level" to ensure a peaceful outcome to the current crisis in Ukraine, Kyivpost.com reported. The body also called the unsigned EU-Ukraine deal "a major missed opportunity." 11:36 GMT: The opposition won’t ‘make a move’ without taking advice from the protesters on the Kiev’s Independence Square, the leader of Svoboda (Freedom) opposition party Oleg Tyagnibok has declared, according to RIA Novosti. “No negotiations [with the government] without the people’s permission,” another, “Bat’kivshchina” party’s leader Arseny Yatsenyuk agreed. 10:53 GMT: The leading Ukrainian Party of Regions has called for the mobilization of supporters of the current country’s leadership. It is planning to stage a 200,000-people protest during the coming weekend, ITAR-TASS reported. Starting from December 3, the party has been carrying out regular meetings in central Kiev, with several thousand gathering to support the Ukrainian leadership. Also in the capital's center, thousands of anti-government protesters have staged their rallies since the end of November. 08:45 GMT: Protesters have erected barricades of ice and snow, which they stuffed into construction waste bags and set up at any streets that lead onto Kreschatik Street, RIA Novosti reports. The structures have grown to 3-4 meters overnight, defending the main square, now controlled by the protesters. But the weather is getting warmer at the moment, with snow and ice beginning to melt. 08:30 GMT: The political crisis in Ukraine could cost the country its bid to hold the 2022 Winter Olympics, warned the Prime Minister Nikoolay Azarov, RIA Novosti reports. Ukraine has put in for the opportunity to do so in mid-November. The games are proposed for the city of Lvov. 07:43 GMT: There were no reports of any transgressions or mass disorder happening overnight in Kiev, Interfax-Ukraine said, citing a police spokesperson. The interior ministry once again urged protesters to behave reasonably and not give in to provocation. The ministry earlier promised that any mass chaos will be dealt with by force. 05:07 GMT: The European Parliament is to vote for resolution on the situation in Ukraine on Thursday, 12 December, reports BBC Ukraine. The project of resolution ‘About the results of Vilnius Summit and future Eastern European Partnership, particularly Ukraine’, deals with the creation of a new EU mission which could help organize negotiations between the Ukrainian government, democratic opposition and civil society and which could help to find a way out of the current crisis in the country. It also calls to release all detained demonstrators. The resolution condemns the use of force and calls on the government to conduct an investigation into it. The resolution also supports the financial aid to Ukraine provided by IMF (International Monetary Fund) and EBRD (European Bank for Reconstruction and Development). 19:36 GMT: The US State Department says that all policy options, including sanctions against Ukraine, are under consideration. "All policy options, including sanctions, are on the table, in our view, but obviously that still is being evaluated," State Department spokeswoman Jen Psaki tells reporters. However, she declines to explain exactly which kind of sanctions are under consideration. 18:53 GMT: Demonstrators in Kiev are rebuilding barricades, using sacks and pouring them with water. This process allows the sacks to freeze, making it difficult to remove them. 18:35 GMT: The White House condemns Ukrainian authorities' response to protesters, urging President Yanukovich to listen to the Ukrainian people and return the country on a path toward European integration. “The right to peaceful protest and assembly must be respected. 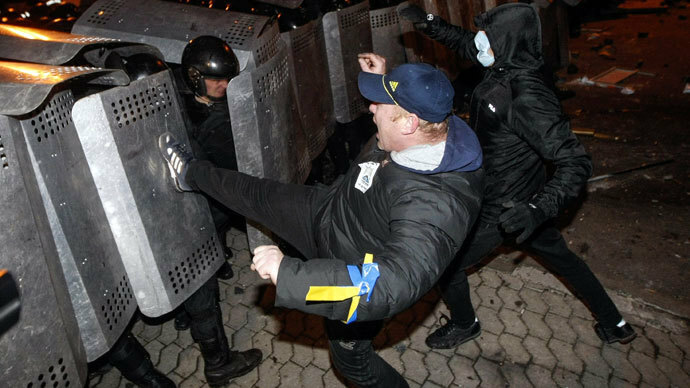 Violence of this sort that we have seen on the streets of Kiev is impermissible in a democratic state,” White House spokesman Josh Earnest says during a briefing, Reuters reports. Lines of communication between the American and Ukrainian governments remain open, he adds. 17:55 GMT: Ukrainian protest leaders say they are not going to hold talks with Yanukovich until their demands, including his resignation, are met. Leader of the nationalist Freedom (Svoboda) party, OlegTyahnibok, calls the President’s earlier invitation for dialogue "a farce and a comedy," Reuters reports. His opposition, Batkivschina (Fatherland) leader Arseny Yatsenyuk, shares the same stance. 17:17 GMT: Ukraine’s Ambassador to Riga, Anatoliy Oliynyk, has been summoned to the Latvian Foreign Ministry over the government’s use of force against protesters last night, reports the ministry’s press service. Such actions “disprove and discredit” earlier statements by Yanukovich on readiness to engage in a dialogue with the opposition and aggravate the political crisis, Riga states. “Violence in Kiev must stop” and a dialogue must be launched, the ministry adds. 16:51 GMT: Ukraine Prime Minister Nikolay Azarov gives assurances there will be no use of force against peaceful demonstrators. “We should stop and calmly look into what is going on,” he says in a statement and adds that mutual understanding and fair decisions can be reached regarding all the problems that have caused protests and confrontations. 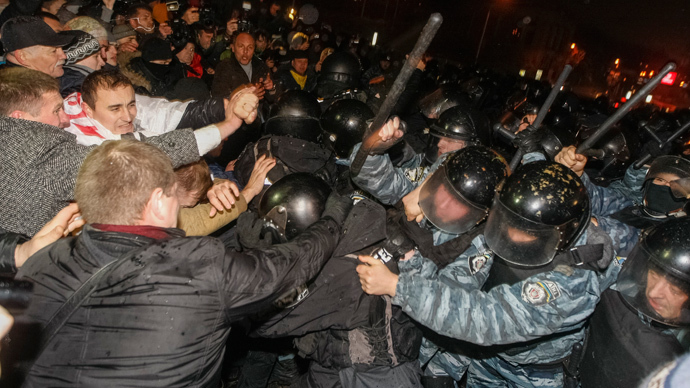 Azarov urged demonstrators not to provoke law enforcers and to obey the law. 16:29 GMT: Ukrainian healthcare officials say 48 people, including 26 law enforcers, injured during protest demonstrations on Wednesday sought medical help. In total, 499 people have sought medical advice since the beginning of mass demonstrations on November 30, Ukraine’s first deputy Healthcare Minister Aleksand Kachur says, cited RIA Novosti. 16:22 GMT: Pro-EU demonstrators erect new barricades in central Kiev. 15:58 GMT: President Viktor Yanukovich urges all the political forces in Ukraine, including the opposition, to start a dialogue on settling the crisis and refrain from making any ultimatums. “I invite representatives of all political forces, clerics, public activists to start a national dialogue. I am ready to take part in such a round table. In order to come to a compromise, I call on the opposition not to reject (the offer), and not to take a path of conflict and ultimatums,” the president says in a statement published on his official website. 15:17 GMT: EU foreign policy chief, Catherine Ashton, says President Yanukovich promised to take measures to settle the crisis within 24 hours, reports Interfax-Ukraine. She added that at their meeting, the Ukrainian leader spoke a lot about strengthening ties between Kiev and the EU. 14:55 GMT: Ukraine’s Interior Ministry isn’t ruling out the possibility that tonight law enforcers will again dismantle barricades set up by protesters in the center of Kiev. The ministry’s deputy head told reporters that such a scenario is possible if marshals of the court make requests to the police. Authorities in Kiev are giving assurances that they are not planning to disperse pro-EU demonstrators and that police are only clearing the streets to restore traffic in the city center. 14:31 GMT: Debate in the Georgian parliament on the Ukrainian standoff ends in a scuffle between the ruling Georgian Dream political bloc and the opposition United National Movement party. The brawl erupted after opposition member demanded that the parliament adopts an official document to support pro-EU supporters. In response, an MP for the majority party used offensive words and called on the opposition to officially condemn the violent dispersal of protests in Tbilisi in 2007 and 2011, when the current opposition was in power. 14:27 GMT: The leader of the Ukrainian opposition Udar (Strike) party, Vitaly Klitschko, said that the overnight police action on Maidan has ruined the possibility of any compromise with the government. “With what happened last night, [Ukrainian President Viktor] Yanukovich closed off the path to any kind of compromise,” Klitschko told journalists, as quoted by Reuters. 13:22 GMT: Ukrainian President Viktor Yanukovich has confirmed his intention to sign the EU association agreement and to start a dialogue for resolving the crisis in the country, EU foreign policy chief Catherine Ashton said in a statement. Ashton then condemned the violence at the protests in Kiev and said that the actions of Ukrainian law enforcers on Tuesday night could hamper the start of the political dialogue. 13:10 GMT: Former Ukrainian President Viktor Yushchenko has refused to take part in the all-nation round table to discuss the situation in Ukraine. The country’s third president has declared that he condemns the way security forces treated the protesters and would go there to protest as well. 12:48 GMT: Opposition MPs have called on the demonstrators to set the security forces’ buses on fire, Ukraine’s Interior Ministry said, as quoted by ITAR-TASS. This refers to three buses that came to the Mayor’s administration building in Kiev to evict protesters. The opposition hosed the buses with water and threw objects like smoke grenades. 12:15 GMT: US assistant secretary of state Victoria Nuland considers the actions of Ukrainian authorities “absolutely impermissible in a democratic society.” She had “tough but realistic talks” with the Ukrainian President Viktor Yanukovich, Nuland told reporters. Nuland is currently in Kiev and has met with the opposition on Independence Square. 11:40 GMT: Only a rapprochement is possible in Ukraine-EU relations, not the EU entrance for Ukraine, the European commission said as quoted by the ITAR-TASS news agency. Ukraine also can’t count on any financial help from the EU, the organization’s official representative Olivier Bailly said. 11:03 GMT: The regional council from the western town of Ivano-Frankovsk has decided to move to Kiev for a session to support the popular anti-government and pro-EU protest. About 70 deputies have gone to the Ukrainian capital, Interfax news agency in Ukraine reports. 10:35 GMT: German Foreign Minister Westerwelle spoke out on the situation in Ukraine, calling for an immediate end to violence inflicted by the security forces. 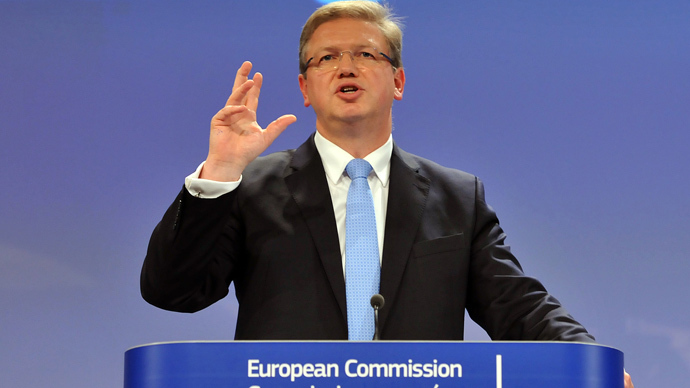 “Instead of a ban on protests and the clearing of Maidan Square, a real political dialogue must now be launched, not just continually promised,” Westerwelle said in an official statement. 10:06 GMT: Protesters put up new barricades 30 meters from the police cordon, as opposition leaders call for storming government buildings, the Interior Ministry said. 09:31 GMT: US assistant secretary Victoria Nuland visited Independence Square in Kiev and talked to protesters, a spokesman for the US embassy confirmed as reported by Reuters. Nuland first handed out cookies to protesters, and later approached security forces, giving them bread and cookies, too. The US assistant secretary of state was accompanied by the US ambassador in Ukraine, Jeffrey Payette. 09:15 GMT: Poland summons Ukraine’s ambassador to voice concern over the use of force against protesters in Kiev, the Polish Foreign Ministry said in an official statement. 09:00 GMT: The full settlement of Ukraine’s welfare payment debts is delayed until the end of the year due to protests in Kiev, Prime Minister Nikolay Azarov said. Ukraine also seeks a 20-billion euro aid package from the EU if it were to sign a trade pact with the EU, the premier added. This refers to mutually-profitable investment in the Ukrainian economy, not a non-refundable bailout. 08:37 GMT: There will be no agreements between Ukraine and the Customs Union, Ukrainian Premier Nikolay Azarov said. "No discussions about the Customs Union! No documents will be signed by the government. I want to waive all these speculations,” the prime minister added. 08:15 GMT: While retreating, police forces were attacked by the protesters who used a smoke bomb. 08:09 GMT: Around 10 buses are parked on Independence Square. 08:06 GMT: Canada is set to consider sanctions against Ukraine's President later on Wednesday over the treatment of protesters. 07:40 GMT: Security forces have stepped back from barricades from one side of the building after attempts to storm it. 07:15 GMT: Security forces have begun to storm the Mayoral Administration building to evict protesters who, in their turn, barricaded from inside. 06:45 GMT: Protesters pour water on policemen from the second floor of the mayoral administration. The temperature in Kiev is -10 degrees Celsius. 06:20 GMT: Journalists who spent the night on Maidan are making an appeal to bring the protesters tea, food and blankets, Kyivpost.com reported. 05:30 GMT: Interior Ministry pledges to react appropriately even if protesters breach the law. Standstill. Barricades being cleared by tractors. Crowd chants "Berkut, go home" #Ukraineprotests. 04:55 GMT: Security forces on Kiev's Independence Square. 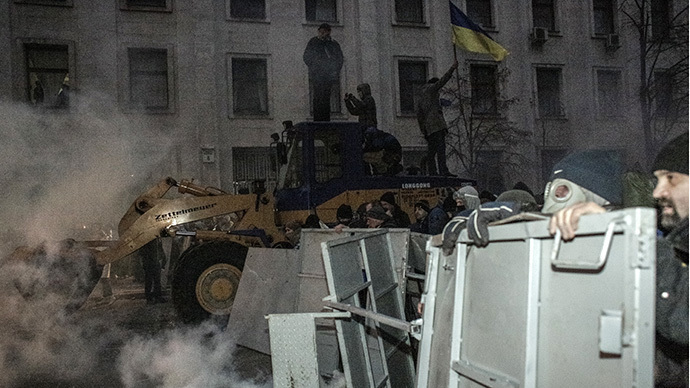 04:35 GMT: The heavy equipment used to clear up the barricades has been taken away from the central streets of Kiev. 04:17 GMT: City workers are clearing barricades as police are lined up, waiting. 04:16 GMT: Two central metro stations, Maidan Nezalezhnosti and Khreshchatyk, were closed because of "mass events downtown," the Kyiv Post reported. 04:13 GMT: US Secretary of State John Kerry called for restraint in a statement focusing on the Ukrainian protests. “The United States expresses its disgust with the decision of Ukrainian authorities to meet the peaceful protests in Kiev’s Maidan Square with riot police, bulldozers and batons,” the statement continued. 04:05 GMT: Several protesters have been injured on Independence Square, Interfax reported. The exact number is still unknown. Meanwhile, 10 officers were wounded in the clashes, the Kiev Post cited police as saying. 03:20 GMT: Protesters have joined a prayer service, calling on special forces to follow scripture, RT's Irina Galushko reports. 03:04 GMT: EU foreign policy chief Catherine Ashton said that she is still in Kiev and is saddened by the use of force against protesters, according to a Facebook statement. EU representatives in Ukraine said they are contacting local authorities to prevent the use of force against demonstrators, according to a statement posted on the groups’s Facebook page. 02:53 GMT: Ukrainian police say they will not remove the protest camp on Kiev’s Independence Square, but will only clear roads for traffic. The news came after special forces moved in on the protesters occupying the premises early on Wednesday, UNIAN reported. 02:44 GMT: Ukrainian police detained several of the most active protesters out of about 1,000 demonstrators present at Independence Square, RIA Novosti quoted local authorities as saying. Police added that security forces have pushed the protesters towards the stage on Independence Square to avoid any public disturbances. Authorities added that demonstrators accidentally set one of the tents on fire, and that security forces are helping protesters who are feeling ill from overcrowding or tear gas. 02:29 GMT: There are reports of gas around the barricades on Institutskoy Street in central Kiev, RT’s Irina Galushko tweets. 01:59 GMT: The majority of protesters have gathered around the stage on Independence Square, where opposition leaders are giving speeches and telling demonstrators to retreat from the barricades without the use of force, ITAR-TASS reported. 01:48 GMT: Protesters gave up barricades at the side of Independence Square "without a fight," RT's Irina Galushko reports. 01:40 GMT: Opposition UDAR party leader Vitaly Klitschko spoke from the stage set up on the Independence Square. "We are defending our right to live in free country … We say no to a police state," Kyiv Post quoted him as saying. Klitschko added that the president must resign. 01:35 GMT: Euromaidan’s twitter feed said it will be a bloody night and encouraged people to come out, RT’s Irina Galushko reported. 01:00 GMT: The standoff in the middle of Independence Square is continuing between police and protesters, with demonstrators linking arms and freezing up. 01:15 GMT: Ukraine’s special forces pushed through the crowds of protesters on Independent Square and divided the demonstrators in half. Both sides are currently continuing the standoff without any other movements. 00:44 GMT: Police are forming a perimeter around the square, preventing people from entering. 00:42 GMT: One of the tents on Independence Square is on fire, RT's Irina Galushko tweeted. 00:32 GMT: City cleaners are following closely behind police, clearing out barricades as officers remove protesters. 00:30 GMT: Some of the protesters remain near City Hall, where prayers are being held. 00:29 GMT: Protesters are shouting, "Tomorrow, there will be a million of us," as they are being pushed out of the way. 00:26 GMT: A group of protesters gathered around a stage to sing Ukraine's national anthem as police encircled them. 00:24 GMT: Another group of special forces began clearing the protesters' barricades on Independence Square from Mihaylovskoy Street. 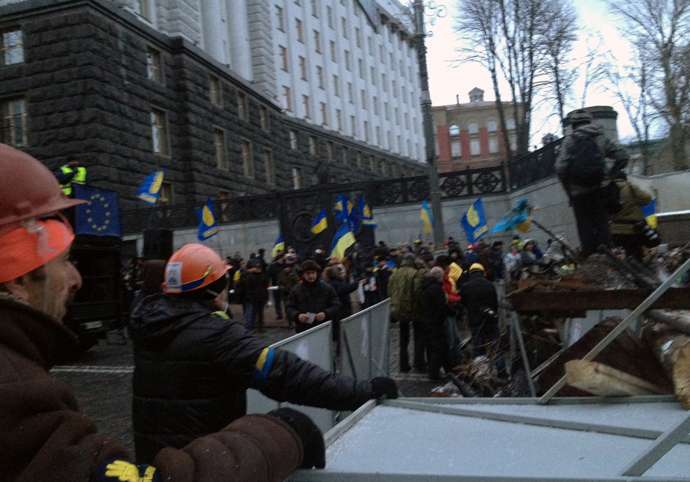 00:13 GMT: Police began clearing one of the protesters’ barricades at the House of Trade Unions, approaching from the side of Independence Square, RT’s Irina Galushko reported. 23:33 GMT: Police in riot gear begin moving towards Independence Square from Institutska Street. 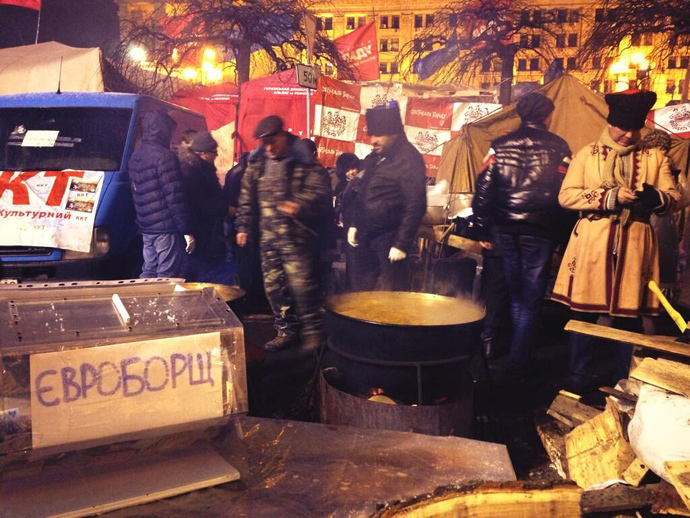 21:00 GMT: Protesters pour iced water onto the streets of Kiev to prevent troops from entering Independence Square. 20:49 GMT: The Kiev mayor’s office has backed the proposal of a Ukrainian company to set up an ice skating rink on Independence Square (Maidan Nezalezhnosti) from December 15 to March 15, despite ongoing protests there, Interfax-Ukraine reported, citing local media. Kiev city authorities have reportedly asked law enforcement bodies to assist with the installations. Although the ice skating rink was set up in the city center in the past, a previous administrative decision from 2011 chose another square for the rink, the report stated. It is not clear why Independence Square is preferred this time by the city’s mayor. The move comes despite recent government promises not to stage any winter celebrations in the square, in an effort to avoid tension. While the reaction from Ukrainian protesters on Twitter ranged from irony to outrage, there was no immediate reaction from the opposition. 19:48 GMT: Ukrainian opposition leader Arseny Yatsenyuk of the Batkivshchyna (Fatherland) party has testified on the violent ejection of protesters from Kiev’s Independence Square (Maidan Nezalezhnosti) at the investigation department of the Ukrainian Prosecutor General’s Office. 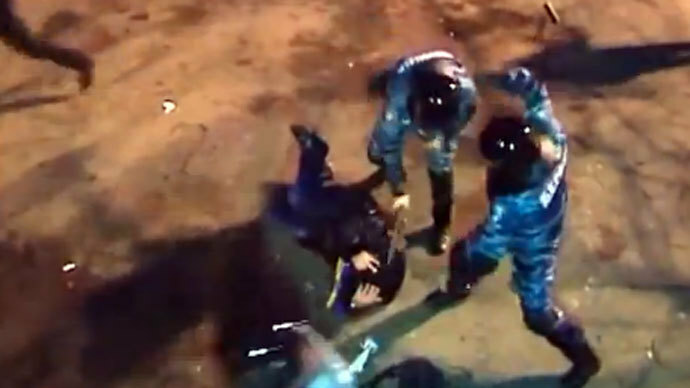 Yatsenyuk said he testified as a witness of police beating, adding that no charges have been laid against him. Ukraine’s Prosecutor General’s Office also said in a statement that it is considering lightening the pre-trial restrictions of some of those detained during the protests, but warned they will not be exempt from criminal responsibility. 18:54 GMT: EU foreign policy chief, Catherine Ashton, discussed “all relevant issues” with Ukrainian President Viktor Yanukovich during their “substantial” 3.5-hour meeting, tweeted Ashton’s spokesman Maja Kocijancic. The EU official is now meeting with opposition leaders, she added. 18:23 GMT: The leader of the Ukrainian opposition Batkivshchyna (Fatherland) party, Arseny Yatsenyuk, has called on the Maidan protesters to change their tactics and to switch to “guerilla raids”. “Our chief goal now is not to let Maidan be dispersed. From here we will make our guerilla raids,” Yatsenyuk said, speaking to several thousand protesters gathered on the square, as quoted by RIA Novosti. It was not immediately clear what kind of action the opposition leader was implying. 17:56 GMT: The EU is willing to maintain dialogue with Russia to convince it that an EU-Ukraine deal will not harm its economic interests, but it won’t hold trilateral talks on the issue, European Commissioner for Enlargement and European Neighborhood Policy, Stefan Fule, said. Echoing a recent statement by European Commission President Jose Manuel Barroso, Fule said in Strasbourg that “the time for limited sovereignty in Europe is gone,” Interfax reports. 17:49 GMT: Ukrainian President Viktor Yanukovich said, during a Tuesday meeting with three former heads of the country, that he acknowledges the responsibility of his government for the recent events in Kiev. “I always try to be impartial in my judgments. This is really a matter of principle for me… All responsibility rests with the incumbent authorities today,” Yanukovich was quoted as saying by Interfax-Ukraine. Yanukovich added that all the law enforcement officers who took part in violent dispersal of Maidan protesters have been suspended from work, at least until the end of the investigation. 17:32 GMT: The European Union is ready to provide financial aid to Ukraine for the implementation of the EU association agreement, European Commissioner for Enlargement and European Neighborhood Policy, Stefan Fule, has said. “We stand ready to help and support Ukraine on its modernization journey, including through topping up IMF loans with macro-financial assistance; by stepping up the European Union’s financial assistance programs to help Ukraine implement the agreement, when it is signed, and helping to bring on board other international partners,” Fule said at the Tuesday plenary session of the European Parliament in Strasbourg. 17:15 GMT: Kiev will define the conditions for signing the EU association agreement before the Ukraine-EU summit in March 2014, Ukrainian President Viktor Yanukovich said at a meeting on Tuesday with the country’s former presidents Leonid Kravchuk, Leonid Kuchma and Viktor Yushchenko. As the deal causes “certain risks to Ukraine’s agrarian sector,” Kiev would negotiate “each commodity group” with Brussels, Yanukovich stressed. The EU has repeatedly stressed that negotiating the agreement itself is out of question, but agreed to discuss ways it could be implemented. 16:36 GMT: Watch RT's Paul Scott reporting from Kiev. 16:14 GMT: A Ukrainian delegation may fly to Brussels for talks on the EU association agreement as early as Wednesday, President Viktor Yanukovich has announced. However, the European Commission reacted to Yanukovich’s statement by saying they were not expecting any delegation on December 11, according to Itar-Tass. No senior European Commission officials, who are necessary for such talks, will be present in Brussels on Wednesday, the body’s press service added. 15:49 GMT: The Kiev appeal court had to postpone the hearing on detained Maidan protesters after a group of people attacked the prosecutor. According to the prosecutor’s spokesperson, cited by Itar-Tass, he identified the perpetrators as MPs from the far-right Svoboda (Freedom) party. A criminal case in connection with the assault has been opened, she said. 13:12 GMT: Twenty Maidan protesters have been hospitalized over the last two days due to sickness, “mental disorders, injuries, alcoholic intoxication and pneumonia,” the Kiev city administration reported. In total, 27 protesters sought medical assistance on December 9 and December 10, the report said. 12:18 GMT: US Assistant Secretary of State for Europe and Eurasia, Victoria Nuland, has met with Ukrainian opposition leaders in the occupied House of Trade Unions at Maidan, RIA Novosti reports citing local media. The US official met with Vitaly Klitschko of the Udar (Strike) party, Oleg Tyagnibok of the Svoboda (Freedom) party, Arseny Yatsenyuk of the Batkivshchyna (Fatherland) party, as well as Ukrainian MP and businessman, Pyotr Poroshenko, and the ex-Interior Minister Yury Lutsenko. Nuland refused to speak to journalists ahead of the talks, and said only that she has “a scheduled meeting with President Yanukovich” after the meeting was over. Earlier on Monday, the US Department of State released a statement urging Russia to “use its influence to press for peace, human dignity and a political solution” in Ukraine, after Nuland had met with several Russian officials and “civil society leaders” in Moscow. 12:09 GMT: The appeal hearings for the rally participants detained in Kiev has been postponed till December 13, according to Interfax-Ukraine, citing Gromadske TV. The decision was made because the defendants weren’t actually delivered to the Kiev Appeals Court. A skirmish reportedly broke out near the court between MPs from the opposition Svoboda (Liberty) party and law enforcers. Several hundred protesters have, according to Gromadske TV, rallied nearby to voice their protest against the detentions. 12:01 GMT: The Ukrainian Foreign Ministry has asked Kiev police to take measures and unblock access to the building of the European Commission’s Delegation to Ukraine after some 50 pro-government demonstrators blocked both entrances of the building. 01:54 GMT: National Security and Defense Council of Ukraine stated that Ukraine’s special forces will not assault the protesters on Independence Square, Vesti quoted Deputy Secretary Vladimir Sivkovich as saying. 01:24 GMT: Ukraine’s special forces have dismantled one of the last barricades in Kiev’s governmental quarters at the intersection of Grushevskogo street and Krepostnogo alley, which was set up by the protesters, according to RIA Novosti. And there are reports of demonstrators moving towards the Independence Square from various parts of city. 01:20 GMT: Police have begun taking down protesters’ barricades on the intersection of Bogomoltsa and Shelkovichnoy streets in Kiev. Around 500 police officers are at the scene dismantling the barricades, reports RIA Novosti. 00:37 GMT: Witnesses are reporting electricity being cut at Kiev’s city hall, which is occupied by protesters, according to local media. 23:18 GMT: The doors of St. Catherine's Lutheran church are open Monday evening to protesters in Kiev's Independence Square who may need medical assistance or other types of aid, RT's Ruptly video news agency reports. The Red Cross is offering medical assistance at the church. 21:49 GMT: German Foreign Minister Guido Westerwelle spoke in support of Ukraine’s protests on Monday. "It would be fatal for the peaceful protests to be undermined by pressure, threats or violence, no matter from which side,” he said in a statement. “The freedom of opinion and assembly must be protected by all government authorities; the protests must not be used as an excuse to perpetrate acts of violence. The law of criminal procedure is certainly not the right tool to apply in order to find a good solution." 21:45 GMT: Famous boxing brothers Vitaly and Wladimir Klitschko joined protesters Monday evening, fighting the police blockade. Wladimir Klitschko stopped a tractor that was moving towards the crowd of protesters, according to the press service of the Ukrainian Democratic Alliance for Reform (UDAR), headed by the older brother Vitaly. 21:04 GMT: US Vice President Joe Biden called Viktor Yanukovich to warn against the use of violence and expressed “deep concern” about the situation in Ukraine. “In a phone call today with Ukrainian President Viktor Yanukovich, Vice President Biden expressed his deep concern about the situation in Ukraine and the growing potential for violence,” said the White House in a statement. 20:52 GMT: About 5,000 are still protesting on the Independence Square. Access to the square is still being blocked by police, local media reports. 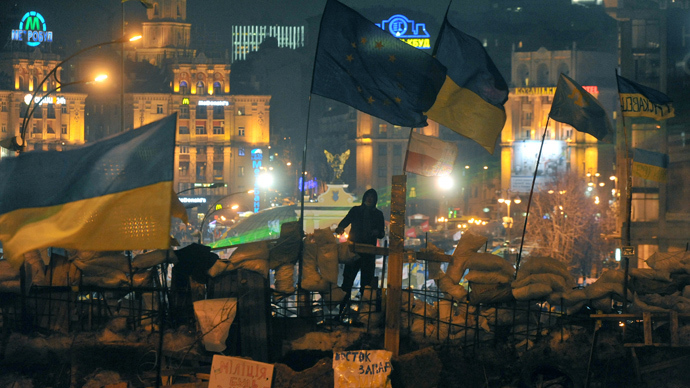 20:48 GMT: Metro stations Maidan Nezalezhnosti and Khreschatyk in Kiev’s downtown remain closed, KyivPost reported. Police have begun closing in on Khreschatyk Street near Hotel Dnipro. Police buses and officers with shields have blocked off access to the area. 20:23 GMT: The International Monetary Fund (IMF) has not changed its stance on Ukraine despite indications from Ukrainian officials of otherwise, an IMF spokesperson told Itar-Tass. The IMF has been insisting on several preconditions for Ukraine securing a new loan, including a 40 percent increase of energy tariffs for Ukrainian citizens – something the country’s government said was unacceptable. 19:39 GMT: The European Parliament on Tuesday will discuss the situation in Ukraine and consider changes to a resolution on the latest events in Kiev, Polish MEP Pawel Kowal told Ukrainian news agency UNN. The resolution, due to go to a vote on Wednesday, is subject to change “depending on what happens on Maidan at night and what the situation will be the next morning”, Kowal said. 19:15 GMT: Ukrainian opposition party Udar (Strike) has promptly evacuated all its central office staff following the search and seizure of equipment at the office of the Batkyvshina (Fatherland) party. A statement published on Udar’s website says that the evacuation was caused by a “threat of a seizure of the party’s premises”. 18:43 GMT: Ukraine’s Interior Ministry confirmed in a statement on its website that it had ordered a search and seizure of computer equipment at the offices of the Batkivshchyna (Fatherland) party as part of a preliminary investigation. The statement did not mention Batkivshchyna by name, but said that the organization occupying the building with an address matching the party’s central office was being investigated on charges of fraud and abuse of power. Computers and documents were seized during the search as evidence for possible criminal proceedings, the statement added. A “group of citizens” has reported fraudulent activity to the ministry, claiming 350,000 hyrvna ($42,800) have been embezzled by the organization at the party’s address, the statement said. 18:14 GMT: Nearly 6,000 law enforcement personnel are keeping public order in central Kiev, including 2,800 Interior Ministry troops, the Ukrainian Interior Ministry told Itar-Tass. 17:55 GMT: The Kiev police will clear the roads in central Kiev from barricades and tents by Tuesday, they said in a statement. 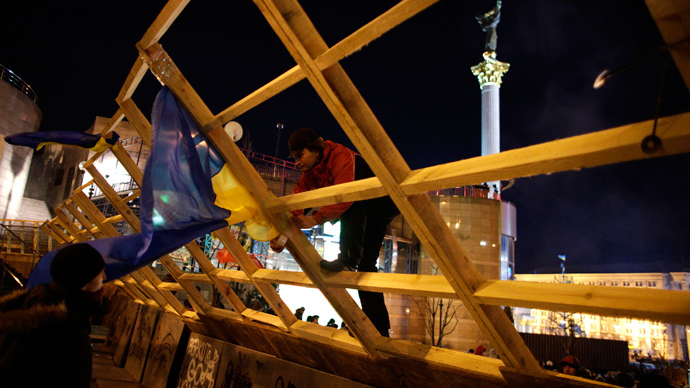 Local police, aided by Interior Ministry troops and public utilities workers have been dismantling structures installed by the opposition protesters on the streets leading to the government offices quarter and Independence Square (Maidan). No clashes have been reported as lines of Interior Ministry troops pushed the demonstrators away from the roads. Although the protesters said their action was peaceful and did not resist the police’s actions, the opposition parties have been calling on their supporters to go to the area. While the Svoboda (Freedom) party has alarmed protesters by saying that the barricades are being taken down, asking them to come to the party’s unofficial street checkpoints on its Twitter page, the leader of the Batkivshchyna (Fatherland) party Arseny Yatsenyuk announced that the protesters will put the tents up in the streets again. 17:49 GMT: Stanislav Shulyak, the chief of Ukraine’s Interior Ministry troops, has said in a statement that his officers must not give in to provocations or allow any blood to be spilt. The safety of citizens and guests of the city should be the troops’ chief concern, Shulyak said. Interior Ministry troops, who do not have authority to attack or retaliate to any violence and are usually armed only with shields, have been positioned on the front lines of police cordons in central Kiev since the pro-EU protests started in late November. 16:33 GMT: The Kiev police have denied in a statement undertaking any action at the offices of the opposition Batkivshchyna (Fatherland) party. Earlier, the party’s spokesman claimed that Berkut special police forces had “stormed” into the Batkivshchyna offices, beating people and turning off the party’s internet servers. The party’s internet site remains offline, as well as the webpage of another opposition party, Svoboda (Freedom). Svoboda said on its Twitter channel that their website was “taken down” Monday. 15:51 GMT: Thousands of protesters headed to the Ukrainian Cabinet of Ministers from Independence Square, according to local news agency UNIAN. The move comes after opposition leader Vitaly Klitschko, of the Udar (Strike) party, said the authorities are trying to “intimidate the peaceful demonstrators” by surrounding the opposition’s unofficial checkpoints, and that the protesters would continue their action regardless. 15:32 GMT: Interior Ministry troops have surrounded the unofficial opposition checkpoint near the Ukrainian Cabinet of Ministers and are dismantling barricades blocking the way to government offices, Interfax reports. There are no ongoing clashes in the area, the agency adds. Citing a local law enforcement source, Interfax says that the protesters have started packing away tents installed in the street after officials read out a court order that banned the blocking of government buildings in Kiev. 15:24 GMT: Kiev police have warned the opposition protesters not to undertake any illegal actions against law enforcement officers surrounding Independence Square and the government offices. Such illegal actions will be prosecuted in accordance with the country’s criminal code, the ministry warned. 15:09 GMT: Reports on Twitter say the protesters are getting ready for the storming of the Mayor’s office building, which they are currently occupying. Photos show people getting armed with improvised weapons such as sticks, and by wearing protective masks and helmets. 15:00 GMT: The police have begun to “push away” protesters from their improvised checkpoints in the government offices quarter in central Kiev, opposition leader Oleg Tyagnibok of the Svoboda (Freedom) party told journalists. The opposition have organized unofficial checkpoints near spots where the protesters have been gathering to picket government buildings. There was no official confirmation of any ongoing police action immediately available. 14:51 GMT: One of the central Kiev metro stations, Teatralnaya, has resumed its operation, while two other stations are still being searched for reported explosives, local police told Itar-Tass. The passengers are being advised to use alternative routes instead of the closed stations, both of which are near Maidan. Earlier, protesters have blocked stairs leading to the closed Khreshchatyk metro station with barricades and slippery cover, fearing the rumors that said the authorities are going to use the station to dispatch special police force to Maidan. 14:27 GMT: The Ukrainian opposition is ready for talks with President Viktor Yanukovich, world heavyweight boxing champion Vitaly Klitschko, who is the leader of the opposition Udar (Strike) party, told Reuters. However, Klitschko reiterated the opposition’s demand that the government must go. “I am sure that the current government must resign... We have announced our demands more than once and in relation to this we are ready to talk with Yanukovich, because no one else is making decisions,” Klitschko said. The opposition leaders are still expecting the police to attempt a forceful breakup of the street protests, he added. 14:01 GMT: Lithuanian Foreign Minister Linas Linkevicius urged the Ukrainian government not to use force against peaceful protesters, saying that otherwise it would be difficult for the European Union to continue a “normal dialogue” with the country. 13:35 GMT: The Interior Ministry troops are not going to storm Maidan and disperse pro-EU protesters there, but will instead attempt to cut off supplies delivered to the square, opposition leader Arseny Yatsenyuk, of the Batkivshchyna (Fatherland) party, has said. “They have not come to seize Maidan, their task is to surround Maidan, to restrict the delivery of water, delivery of food, delivery of equipment and the coming of people [to the square],” Yatsenyuk was quoted as saying by the local UNIAN news agency. 13:07 GMT: Fragments of the Lenin monument demolished by protesters on Sunday in Kiev are being sold online. “I’m selling pieces of the last Kiev Lenin,” an ad one of the most popular Ukrainian e-shops reads, Interfax-Ukraine reported. 12:30 GMT: The internal security troops that have converged to Independence Square do not have the task to sweep the center of Kiev of the protesters, told journalists first deputy of Interior Ministry troops staff Aleksandr Oleschenko. “There is no such task for interior troops,” he has been cited by Ukrainian Pravda newspaper, the troops task is to keep guard of the public peace. 12:25 GMT: US actor George Clooney has recorded a video message in support of the anti-government protesters in Ukraine. The message was sent to Ukrainian heavyweight boxers Vitaly and Vladimir Klitschko. One of the brothers, Vitaly, leads the opposition Udar (Strike) party. 11:57 GMT: Ukrainian President Viktor Yanukovich is set to discuss his country’s future with three of his predecessors Tuesday. Yanukovich’s press service says the idea came from Leonid Kravchuk, who became the first president of Ukraine in 1991, after the collapse of the Soviet Union, and stayed in office until 1994. Kravchuk believes the opposition should be invited to the talks. Kravchuk, as well as his two successors, Leonid Kuchma and Viktor Yushchenko, has supported the opposition protests against Yanukovich’s government suspending talks on signing the free trade and association deal with the EU. 11:55 GMT: Around 50 soldiers of the Ukrainian army are on their way from Mikhailovskaya Square to the Independence Square (Maidan Nezalezhnosti) where protesters are camped out, RIA Novosti reports. The soldiers are holding shields and wearing helmets. They refuse to explain where they are going and for what purpose. 11:45 GMT: Three central Metro stations have been shut down in Ukraine’s capital Kiev over alleged calls with bomb threats. 11:43 GMT: EU foreign policy chief Catherine Ashton will visit Kiev on December 10-11, according to President of the European Commission, Jose Manuel Barroso. 11:41 GMT: A convoy of several police vehicles has arrived at Kiev’s city center. It was earlier announced that the convoy would bring police officers for personnel rotation. 10:04 GMT: Hundreds of protesters remain camped out in Kiev's Independence Square (Maidan Nezalezhnosti) despite temperatures having turned sub-zero Celsius in the Ukrainian capital. Protesters are continuing their blockade of key governmental buildings, according to RT’s Paul Scott reporting from Kiev. 22:32 GMT: Protesters are building another barricade from materials they borrowed at the nearby office building, including fittings, plywood and wooden beams, RIA reports. 21:14 GMT: Protesters are stripping wooden scaffolding from an office building near the square, where the monument to Vladimir Lenin was vandalized earlier. A masked youth told RIA that these materials would be used for building new barricades. 20:33 GMT: The Ukrainian government has received a “positive signal” from the International Monetary Fund (IMF) during latest negotiations on the new IMF loan, the Ukrainian Minister of Revenues and Duties, Aleksandr Klimenko, said in an interview with local channel 1+1. “Regarding the IMF, our stands on tariffs policy, on budgetary and monetary policies have significantly got closer. Today we received a positive signal from the IMF and we are ready to finish the negotiations and take on the credit,” Klimenko said. The real progress could be reached within 1-2 weeks, the minister added. As one of the preconditions in order to secure the loan, the IMF insisted on a 40 percent gradual increase of energy tariffs for Ukrainian citizens over the next few years. 20:12 GMT: The central Kiev’s Independence Square (Maidan Nezalezhnosti) can only hold about 100,000 people dressed in winter clothes, Ukrainian Interior Ministry said in a statement. 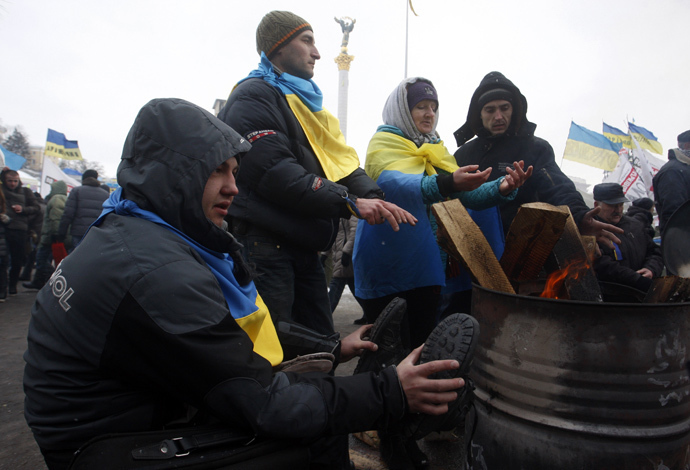 Even after parts of the streets adjacent to Maidan were added to the square’s accessible area in the ministry’s calculations, “only 100 thousand people can physically” take part in winter time demonstrations there. Earlier, the opposition Udar party claimed 1 million people gathered in central Kiev, while the police put the number at merely 50,000 people, later increasing the estimate to 100,000. 19:50 GMT: The Ukrainian government has called on the protesters rallying in central Kiev to stop blocking access to administrative buildings, saying that their normal work is vitally important to the daily life of all Ukrainian citizens. According to Vitaly Lukyanenko, the spokesman for Ukrainian Prime Minister Nikolay Azarov, the Cabinet of Ministers staff has been told that December 9 is a “normal working day”. When asked how he was going to get to work, Lukyanenko replied “by foot”. While the pro-EU demonstrators have been blocking the entrance to the Cabinet of Ministers since December 2, on Sunday they also erected barricades on a street leading to the government quarter in central Kiev. 19:24 GMT: Demonstrators have blocked traffic in Kiev’s central Taras Shevchenko boulevard after crowds moved to the toppled monument of Russian revolutionary leader Lenin. While some of the protesters smashed the fallen statue with hammers, others formed a big line, wanting to get pieces of the granite statue as souvenirs. The Mayor of Kiev Aleksandr Popov, as well as the country’s Communist Party have condemned the toppling of Lenin’s statue as vandalism and provocation. Meanwhile, Batkivshchyna (Fatherland) opposition party member Andrey Shevchenko claimed the opposition “by no means sanctioned” the felling of Lenin, saying that the incident was “self-organized”. 18:49 GMT: Opposition leaders speaking to protesters on Maidan have urged them to “gather at 5am the next day to start picketing the government buildings”. Arseny Yatsenyuk of Batkivshchyna (Fatherland) party said that the protests on Sunday night and Monday will be “crucial,” adding that the people are not going to storm any government buildings. Several members of the opposition party Udar (Strike) have erected tents near the Ukrainian Interior Ministry and are demanding that the ministry and the whole government resign. 18:26 GMT: The Ukrainian government will “begin consultations” aimed at defusing tension in the country, President Viktor Yanukovich told UN Secretary General Ban Ki-moon during a telephone conversation. The presidential press service did not elaborate on whose counsel the government was going to seek. Speaking with Yanukovich, the UN Chief urged restraint from violence and called on all sides of the Ukrainian crisis to start a dialogue. 18:18 GMT: The protesters rallying on Kiev’s Maidan square have approved the election of a self-proclaimed “revolutionary commandant” Nikolay Katerinchyuk. Addressing the crowds from a stage on Maidan, the “commandant” urged the crowd to take the city under “full control”, to place “checkpoints” at all roads leading into Kiev and to make the military and the police ask protesters for “permission” before making any move. Katerinchyuk has also vowed to “throw [Kiev’s mayor Aleksandr] Popov out of his cabinet, as he is not fulfilling his duties”. 17:45 GMT: The Ukrainian opposition will be fully responsible for any violence that could follow the massive protest rally, Mikhail Chechetov of the ruling Party of Regions has said. According to the politician, some provocations are being prepared to turn the peaceful rally into violent riots that could result in injuries or deaths, as the opposition leaders “have fully lost” control of the protests in Kiev. Earlier on Sunday, the Party of Regions condemned the opposition’s actions as attempts to “discredit the government, the president at any cost” ahead of the 2015 elections, but said that it will show restraint and fight such actions within the bounds of the law. Unlike those living in tents on Maidan, millions of other Ukrainians “want to live and work normally,” the party’s press service said. 17:10 GMT: Opposition leader Oleg Tyagnibok of Svoboda (Freedom) party has condemned the Security Service of Ukraine (SBU) for opening a criminal investigation into ‘actions directed at a government takeover’. He called the move a “provocation” and an attempt to “terrorize” the people. Meanwhile, a security source told Itar-Tass some opposition leaders, including Batkivshchyna (Fatherland) party leader Arseny Yatsenyuk, are on the list of suspects in the case. 16:38 GMT: Nearly 100,000 people are taking part in Kiev rallies, Ukrainian Interior Ministry said, adding that some protesters have blocked several of the city’s central streets. The ministry reminded that the actions of peaceful protesters “should not infringe rights of other citizens” and warned that blocking traffic is punishable in accordance with the country’s criminal code. 16:17 GMT: A group of protesters has taken down the monument to Russian revolutionary leader Vladimir Lenin on Kiev’s Bessarabskya Square, reports RT’s Irina Galushko. Dozens of protesters attempted to deface the monument last week, but were repelled by riot police. Ukraine’s Communist Party decried the attempt as unacceptable and placed a patrol to guard the monument. However, neither the party’s patrol, nor police were seen guarding the Lenin’s monument on Sunday. 15:42 GMT: The Security Service of Ukraine (SBU) has launched a criminal case into “actions directed at a government takeover” in the country, the agency said in a statement. “Certain politicians” are suspected of undertaking unlawful actions with the ultimate aim of organizing a coup, the SBU said, adding that no charges have yet been filed in the case. Such actions are punishable by jail terms of five to 10 years, according to Ukrainian law. 15:21 GMT: Leaders of the Ukrainian opposition on Sunday have been considering who could take which roles in a “technocratic government” they intend to form in case the government resigns, Itar-Tass reported, citing “reliable” media sources. According to sources, Arseny Yatsenyuk of Batkivshchyna (Fatherland) party has claimed the role of prime minister, while Oleg Tyagnibok of Svoboda (Freedom) party has been selected as a possible Interior Minister and Viktor Pinzenyuk of Udar (Strike) party has the been eyeing the role of Finance Minister. 14:42 GMT: EU foreign policy chief Catherine Ashton will next week travel to Ukraine “to assist in finding a way out of the political crisis” in the country, says a communiqué published after talks between European Commission President Jose Manuel Barroso and Ukrainian President Viktor Yanukovich. Meanwhile, police have been dispatched to cordon off the presidential residence located in a village in Kiev Region, a local police spokesman told RIA Novosti. The opposition on Sunday threatened to block President Yanukovich’s residence if the Ukrainian government does not resign in 48 hours, despite a court ban on all gatherings in the village. 13:38 GMT: Pro-EU protesters, including activists from the opposition Svoboda (Freedom) party, have blocked the street next to the Ukrainian Cabinet of Ministers. Metal shields and concrete flower-beds from a nearby park are being carried by the protesters to block the roads. 13:12 GMT: Nearly 50,000 protesters have gathered on Independence Square (Maidan) and in nearby streets, according to police estimates. The police said 37,000 people are rallying on the square, as a large group of protesters marching toward government buildings with flags approached a thick police cordon surrounding the parliament (Verkhovna Rada) and the Cabinet of Ministers. Barricades are now being erected in streets adjacent to the government buildings, but the protesters are not going to storm them, according to the opposition. 12:40 GMT: The pro-EU protesters will from now on occupy “the whole government quarter” of the city where key offices are situated, says opposition leader Arseny Yatsenyuk, speaking from a stage on Maidan. Some 15,000 people are taking part in a pro-government rally in support of Ukrainian President Viktor Yanukovich, said the Ukrainian ruling Party of Regions, which organized the rally. The rally participants, who started gathering in Mariinsky Park near the Ukrainian parliament, the Verkhovna Rada, now occupy the entire square in front of the building, as well as part of a nearby street, according to an Itar-Tass correspondent reporting from the scene. 12:15 GMT: Former Ukrainian Prime Minister Yulia Tymoshenko, who is currently serving a 7-year term in jail, has called on the protesters and the opposition not to enter talks with the Ukrainian government unless it resigns. “Do not give up, do not take a step back, do not sit at the negotiation table with the regime,” Timoshenko said in her address to the Maidan protesters which was read out by her daughter Yevgenia. She also called for forming a group for negotiations with the Ukrainian military, a group for investigating top-level corruption cases, and urged to form a new system of government. 12:00 GMT: German Chancellor Angela Merkel, her party Christian Democratic Union (CDU), along with the European People’s Party (EPP), which unites EU’s conservative parties, are set to provide support to Vitaly Klitschko and his Strike (Udar) opposition party, reports German weekly Der Spiegel, citing sources in the government and EPP. A range of politicians in the EU want the pro-European Klitschko to become a key leader of the Ukrainian opposition. According to Spiegel, Merkel will meet with Klitschko in mid-December, on the sidelines of an EPP meeting in Brussels. Udar will reportedly get “logistical support” as well as help in the development of the party structures and training for new members. 09:42 GMT: Five thousand supporters of the ruling Party of Regions have gathered for a pro-government rally in Kiev’s Mariinsky Park near the parliament, Verkhovna Rada, Ukraine’s Channel 5 reports. 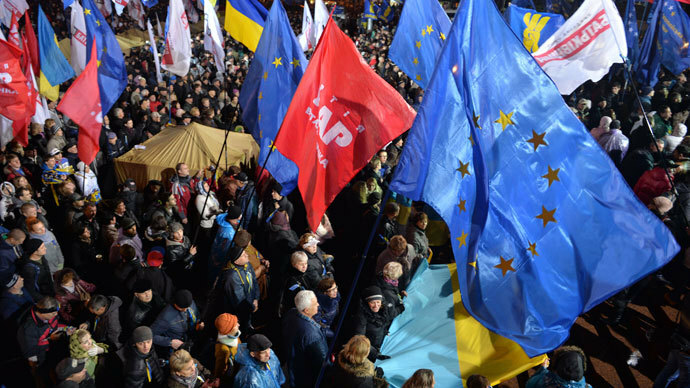 The participants of the rally, called under the slogan, “Let’s create Europe in Ukraine,” are urging a peaceful resolution of the current political crisis, and they condemn the opposition for what they see as an attempt to destabilize the situation in the country and to split Ukrainian society. 03:11 GMT: The opposition Batkivshchyna (Fatherland) party says Ukrainian authorities are planning to use around 1000 provocateurs to induce violence that will be used to install martial law, RIA Novosti reports. "We warn the government that we know about these plans. We appeal to the people at Maidan asking them to be vigilant. We ask law enforcement officers to prevent the massacre and not be complicit in acts of provocation", the statement said. 00:32 GMT: UN Deputy Secretary General for Political Affairs Jeffrey Feltman, upon completing his three-day visit to Ukraine, has expressed concern over the situation and warned against the use of force in Ukraine. The Deputy Secretary General met with representatives of the government and the parliament as well as political parties and civil society organizations. At the end of the trip he recommended that all parties immediately begin a process aimed at de-escalation of tensions. 18:42 GMT: Police estimate that some 10,000 people protest in the Independence Square and a further 3,000 have gathered in front of the parliament. 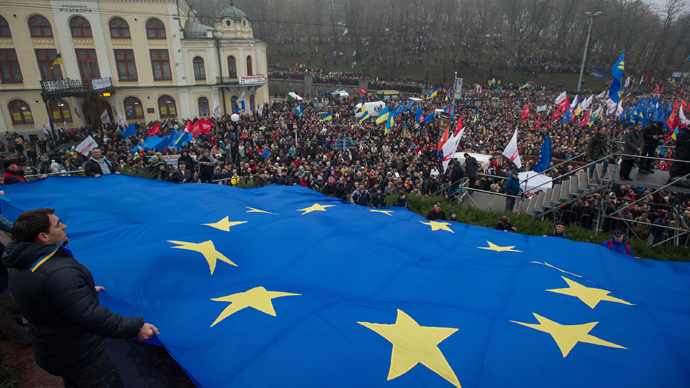 18:00 GMT: Thousands rally in the Independence Square to support the EU accession. 16:40 GMT: European MPs have talked to the opposition leaders in Kiev, expressing full support of their demand for early an election in Ukraine. "A situation when the choice of the majority of Ukrainians, millions of people, is being put aside is unacceptable. We advocate the finding of a peaceful solution to the standoff in Ukraine and back the demand to hold an early vote,” Jacek Saryusz-Wolski, a European Parliament member from Poland, stressed. 16:35 GMT: If those responsible for the violent dispersal of the pro-EU protest in Kiev on November 30 won’t be punished some of Ukraine’s top officials will be denied entrance into Europe, Elmar Brok, chairman of the European Parliament Committee on Foreign Affairs, said. 15:01 GMT: The former president of Georgia, Mikhail Saakashvili, has appeared before the pro-EU protesters on Independence Square in Kiev and addressing the crowd in the Ukrainian language, RT’s Irina Galushko reports. 14:45 GMT: Ukrainian opposition leaders Arseny Yatsenyuk (Batkivshchyna party), Vitaly Klitschko (Udar party) and Oleg Tyagnibok (Svoboda party) have come up with three basic requirements for them to start talks with the country’s authorities. “We demand the release of all political prisoners detained on Independence Square, we demand those responsible for the violent dispersal of the Maidan demonstration to be punished, and we demand the resignation of the government,” Klitschko said at a news conference in Kiev. If their demands are met, the opposition leaders said they would be prepared to negotiate terms for the formation of a new, technical government which would sign an association agreement with the EU, they said. 13:20 GMT: Anti-government protesters are heading to picket Kiev’s main TV center, where the country’s major TV channels are located. “The purpose of the picket is to support fair journalism. We demand that the situation in Ukraine is shown objectively,” an organiser of the Maidan demonstration is saying. Berkut riot police are currently guarding the TV center. 12:31 GMT: Mass protests in Ukraine are continuing “without any serious violations,” the Ukrainian Foreign Ministry says. Within the last 24 hours, there have been 123 mass protests with over 8,000 demonstrators in Kiev. According to the ministry, over 6,500 police officers and Berkut riot police are currently guarding protests in the country, including 4,000 in Kiev. 11:45 GMT: The former Georgian president, Mikhail Saakashvili, has arrived in Kiev and met the leader of the opposition party Strike (Udar), Vitaly Klitchko, UNIAN news agency reports. According to Ukrainian media, Saakashvili and Klitchko will both deliver speeches to demonstrators on Independence Square in Kiev. 09:58 GMT:“Russia and Ukraine didn’t discuss the question dealing with Ukraine joining the Customs Union,” RIA Novosti reported Vladimir Putin’s spokesman Dmitry Peskov as saying. On Friday, Ukrainian President Viktor Yanukovich met with his Russian counterpart, Vladimir Putin, to discuss a new strategic partnership agreement, Ukrainian Prime Minister Nikolay Azarov told foreign media. Earlier, the Economist, citing its own sources, had claimed Ukraine had signed an agreement with Russia including Ukraine’s commitment to join the Customs Union of Belarus, Kazakhstan and Russia. 09:30 GMT:“Ukrainian law enforcement forces whose duty is to maintain order in the country faced open violence and provocations,” says Ukrainian Prime Minister Nikolay Azarov. On Saturday, November, 30 Berkut riot police, using tear gas and clubs, violently dispersed the pro-EU integration protesters on Independence Square in Kiev. At least 35 people were injured in the clashes. However, police say the dispersal and beating of demonstrators came after provocations. 09:07 GMT:“Russia and Ukraine didn’t discuss the question dealing with Ukraine joining the Customs Union,” RIA Novosti reported Vladimir Putin’s spokesman Dmitry Peskov as saying. 08:30 GMT: Berkut riot police are guarding Kiev’s main TV center, RT correspondent Irina Galushko reports from Kiev. Local media say at least two busloads of Berkut officers are at the scene, along with several vehicles carrying regular police. The authorities are not commenting on the reason for the deployment. 07:20 GMT: Hundreds of anti-government protesters are resuming their demonstration on Independence Square in Kiev, RIA Novosti reports. The protest, which was sparked by the government’s decision to suspend talks on a trade agreement with the EU, is in its third week now. 07:02 GMT: Ukrainian Prime Minister Nikolay Azarov says he supports the idea of a trilateral commission to investigate the eviction of opposition activists last week, UNIAN news agency reports. “We are ready to create an independent group which will investigate the controversies,” Azarov said during a meeting with the Secretary General of the Council of Europe, Thorbjorn Jagland. “The commission must be impartial. Its members should abide by the Constitution of Ukraine. 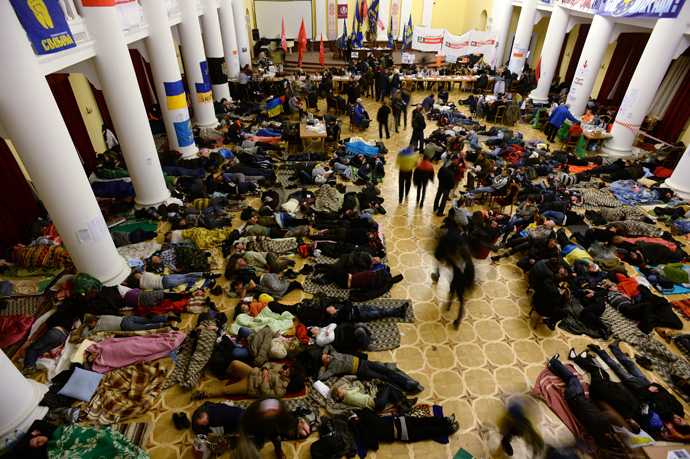 And first of all, the protesters should free the administrational buildings [they seized last weekend],” Azarov added. It was Jagland who suggested the idea of an inquiry into the Kiev violence. The proposed commission would include representatives from the pro-EU opposition, the Ukrainian government and the international community. 06:18 GMT: Two protesters have been arrested by a Kiev court over the violent clashes on Bankovaya Street on December 1, Kiev police said. The court ordered that the activists, from the Road Control (Dorozhnaya Kontrol) opposition group, be held in custody for two months. Earlier on Friday, another activist from the same group, Andrey Dzindzya, was arrested. He is suspected of stealing a tractor that was used by protesters to try to break through a police cordon near the presidential administration building in Kiev. During the Friday hearings, scuffles erupted in the courtroom between several opposition MPs and bailiffs. While the court was in session, dozens of protesters blocked the courthouse, demanding the release of Dzindzya. 05:45 GMT: The leader of the opposition party Strike (Udar), Vitaly Klitchko, voiced three key conditions for a start of negotiations with the government, UNIAN news agency reports. He demanded the release 14 Maidan activists who had been arrested by the authorities. The opposition is also demanding the prosecution of police officers responsible for brutality against activists and journalists, and is calling for the resignation of Interior Minister Vitaly Zakharchenko. Klitchko made a comparison between Ukraine and Latvia, where several senior government officials, including Prime Minister Valdis Dombrovskis, resigned after the deadly collapse of a shopping mall. “Azarov’s government which led the country into economic and political crisis even doesn’t think about resignation,” Klitchko said. 01:33 GMT: Washington, along with Brussels, is continuing to support Ukraine on its European path, US State Department Deputy Spokesperson Marie Harf said. 01:20 GMT: Ukrainian President Viktor Yanukovich and his Russian counterpart, Vladimir Putin, met to discuss a new strategic partnership agreement, Ukrainian Prime Minister Nikolay Azarov told foreign media, Itar-Tass reported. "The issue on the agenda was drafting a major strategic partnership agreement with Russia, complemented with a road map eliminating disputes over trading and economic issues," Azarov said. "Ukraine and Russia are determined to fully eliminate the contradictions that have piled up in bilateral relations over the past three and a half years, including controversies over the gas supply contract and the disruption of industrial cooperation." 14:45 GMT: Yulia Tymoshenko has abandoned her hunger strike in protest against the government’s refusal to sign the EU trade deal, which she began on November 25. The news was told by her daughter to UNIAN news agency. 12:50 GMT: A statement from retired security officials says that the country risks falling into a “state of chaos” and condemns all sides for escalating the stand-odd in the country. “Constitutional standards are being replaced by political or other imperatives, chaos and irresponsibility, as was demonstrated by the excessive use of force by the government, and the occupation of government offices by the opposition,” said an open letter on the official security services website. 12:40 GMT: Supporters of the nine demonstrators arrested following the failed storm of the president’s office on Sunday have staged a 'lie-in' outside the General Prosecutor’s office, demanding their release. “By overstepping the law, the prosecutors are ‘stepping over’ Ukrainian citizens,” said a statement from the Democratic Alliance party, explaining the symbolism of the protest. 11:13 GMT: The leader of Opposition Batkivshchyna (Fatherland) party Arseny Yatsenyuk said that the leaders of the opposition, including Yatsenyuk himself, are to be questioned by the prosecutor’s office, the “Ukrainskays Pravda” newspaper reports. 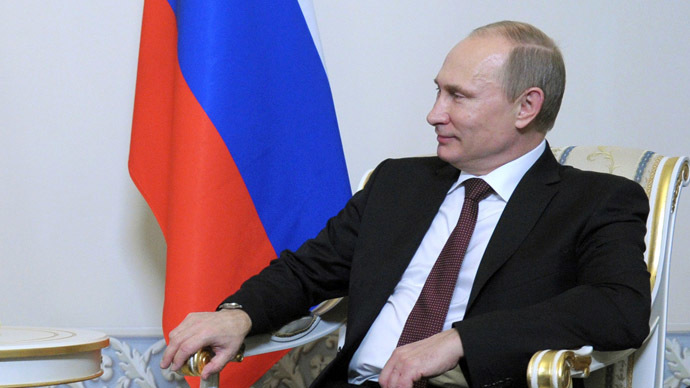 10:00 GMT: Russian Prime Minister Dmitry Medvedev said that the West is meddling in Ukraine’s internal business. “To show up somewhere is one thing. But to participate is to meddle in other people’s internal affairs,” the PM said.